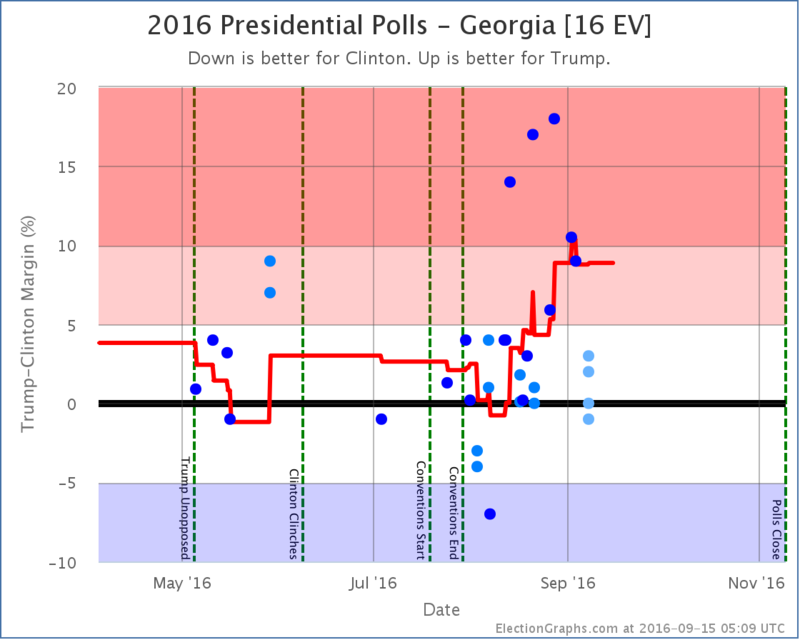 With new polling, two of the three results showing a Clinton lead in Georgia roll off the average, replaced by results showing Trump ahead. 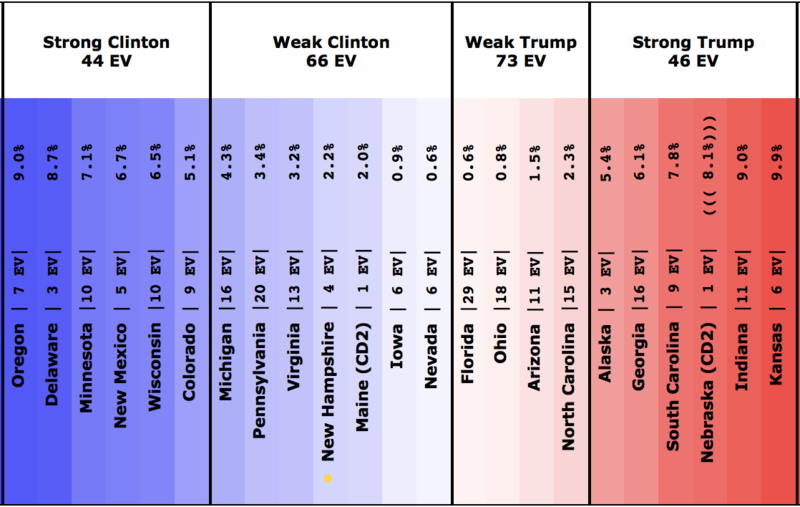 The average in the state moves to a 0.4% Trump lead. 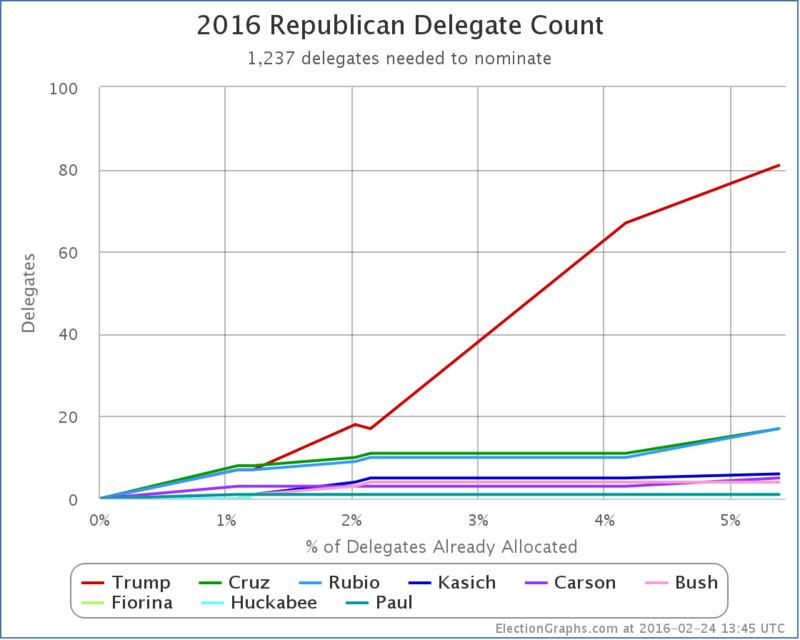 This is an incredibly narrow lead. Georgia really could go either way. 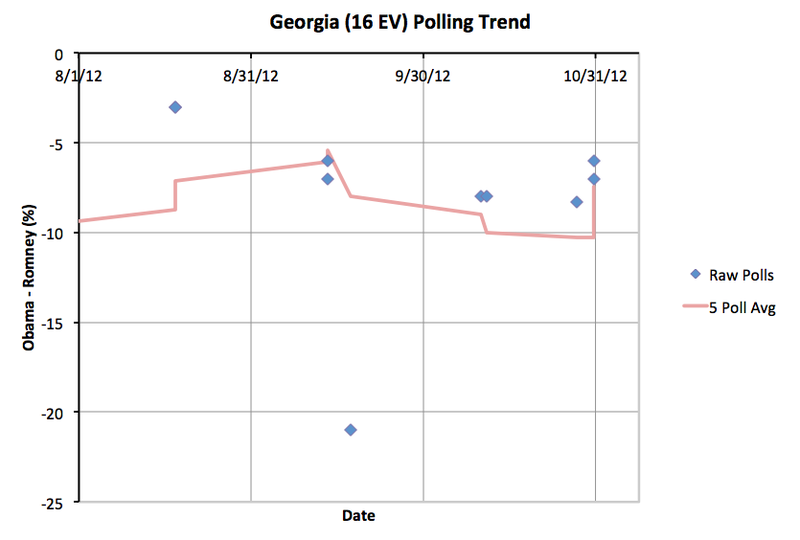 But for the moment, Georgia is once again on the more familiar red side of the center line. 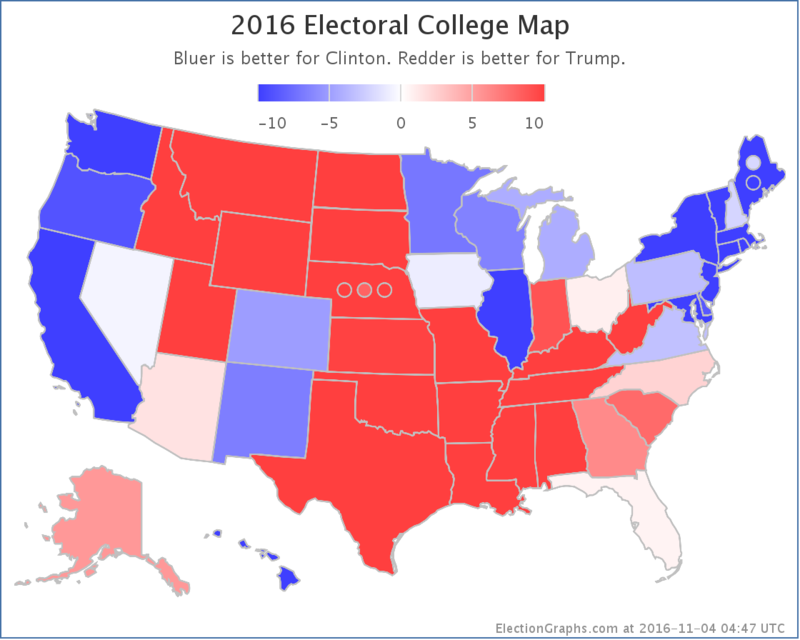 With this, the “expected” result, where each candidate just wins all the states they are ahead in, returns to Clinton 347 to Trump 191, a 156 electoral vote win for Clinton. 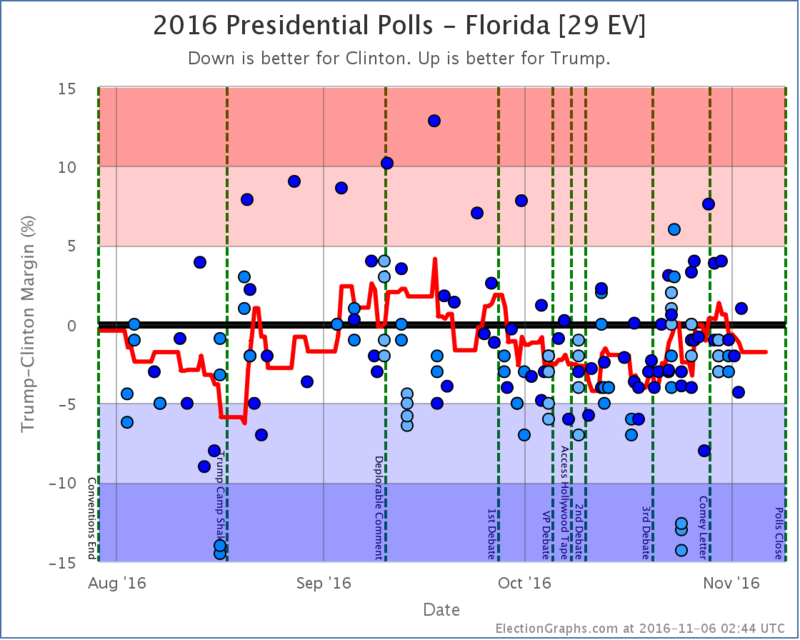 Still clearly in the zone where Trump does better than McCain (192 electoral vote loss) but worse than Romney (126 electoral vote loss). 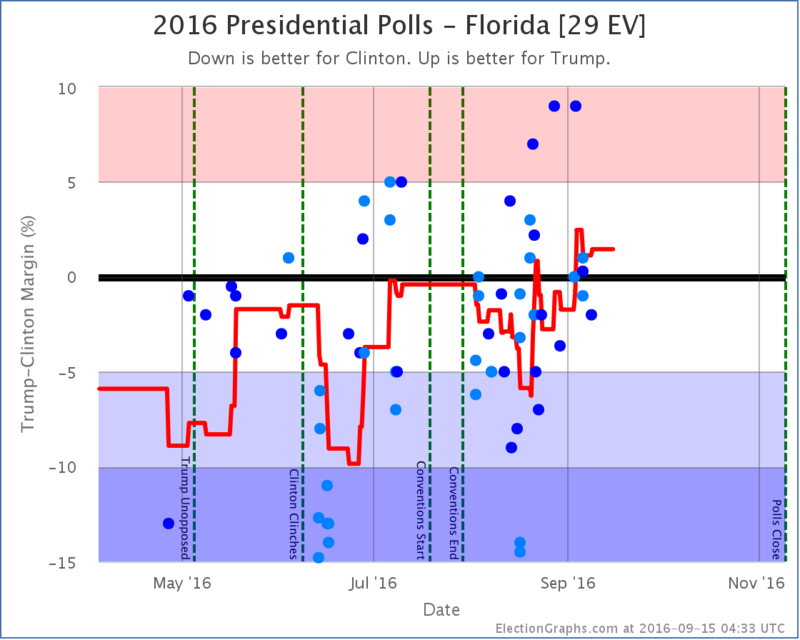 Does this indicate Trump has bottomed and is now on the rebound? Well… Georgia is a state that has looked close for months. 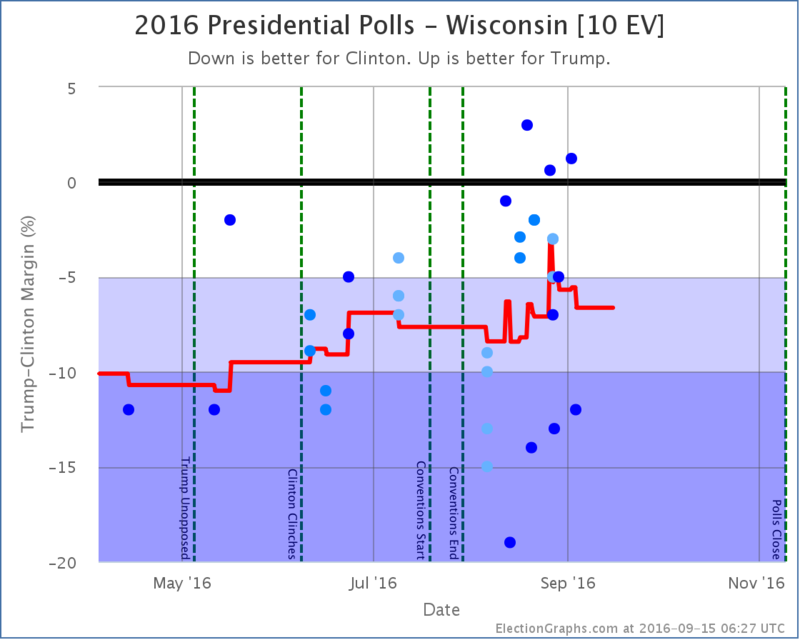 The polls bounce around quite a bit. 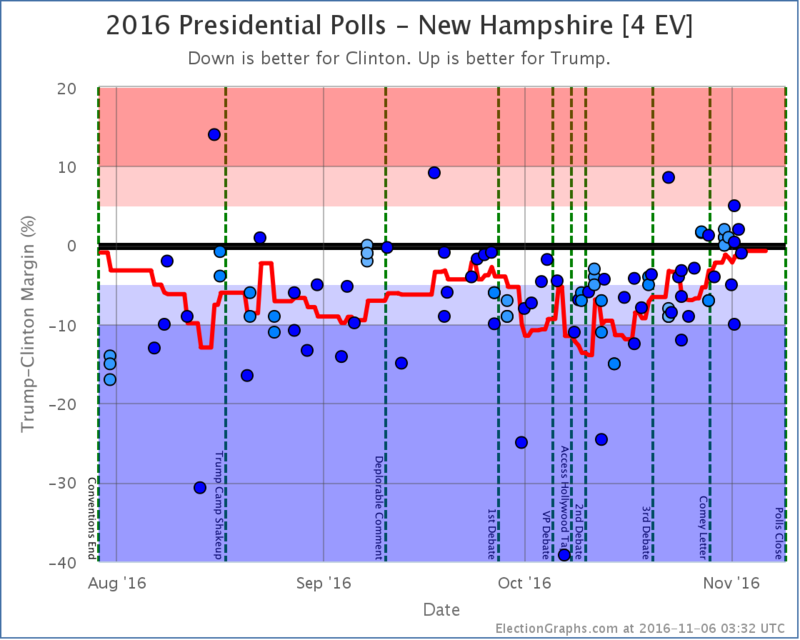 A move from a 0.8% Clinton lead to a 0.4% Trump lead may not be super significant. It may flip back with the very next poll. So as usual, use caution in interpreting a move like this. 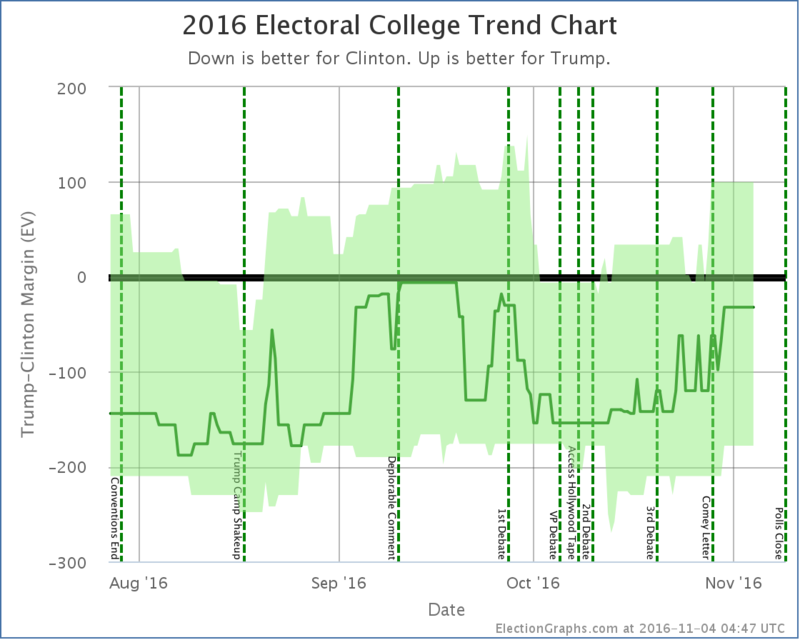 If it is followed up by more good news for Trump, then we can start talking about a Trump rebound. For now, that is still premature. 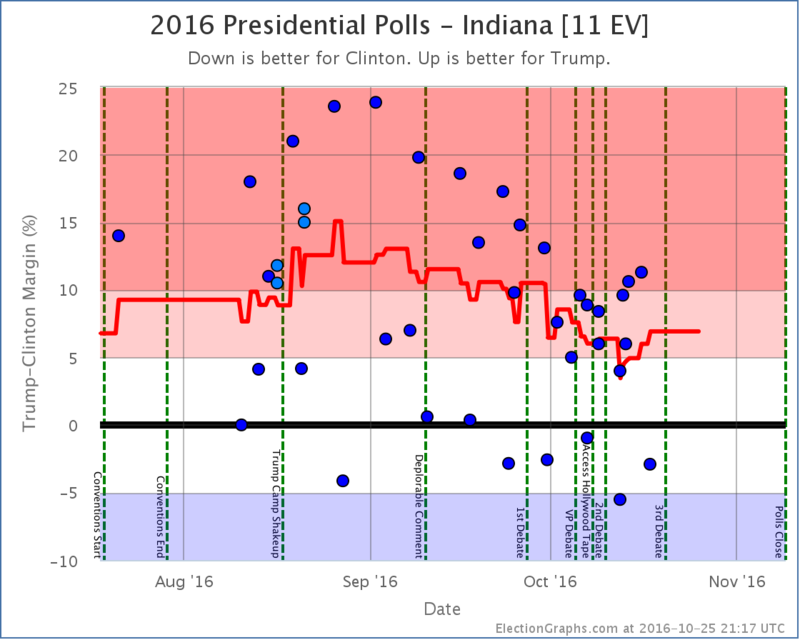 81.1 days left until the polls start to close. 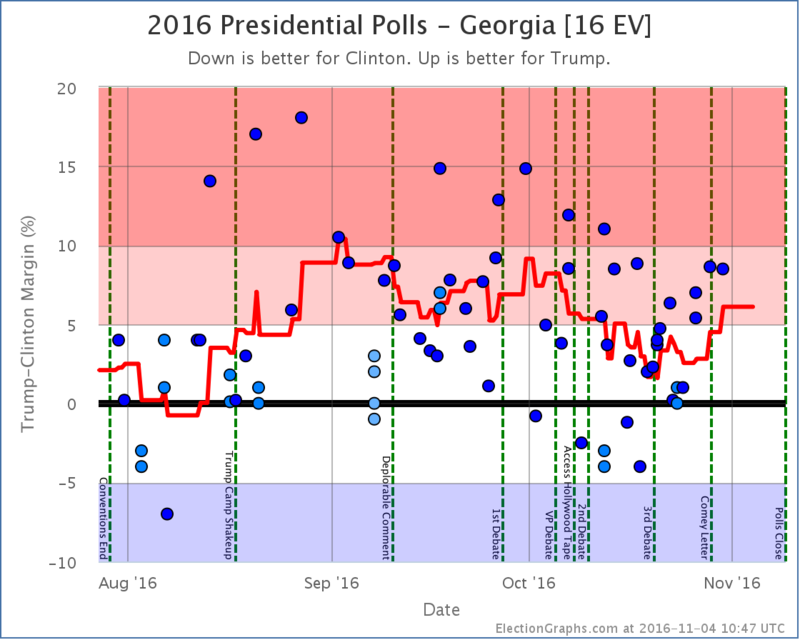 With the latest results in Georgia, Clinton once again leads… but the polls in the average range from Clinton +4.0% to Trump +4.0%. The average itself is very close. Clinton only leads by 0.3%. The only real conclusion here right now is that Georgia could go either way. Which is remarkable, since this is Georgia. Georgia hasn’t gone blue since Bill Clinton won there in 1992. 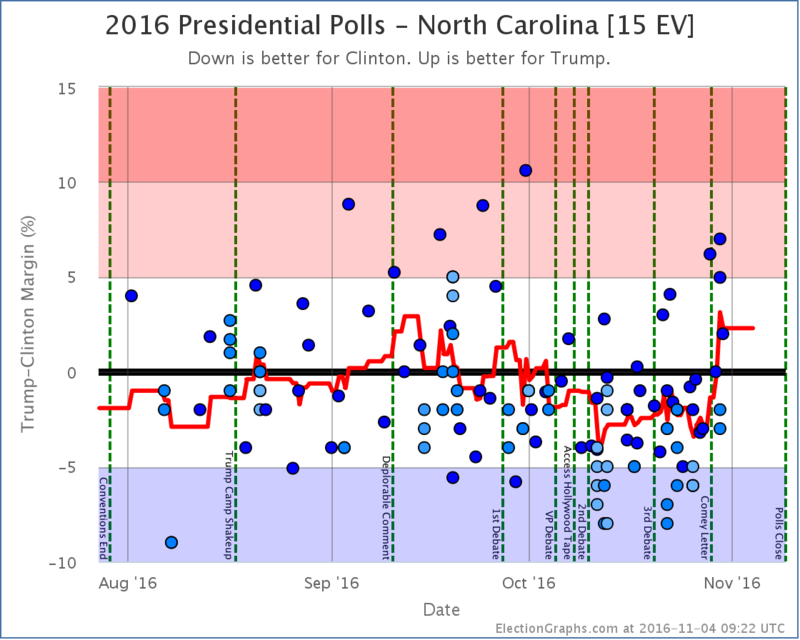 Clinton’s very narrow lead here may well disappear with the very next poll, but for the moment, she is slightly ahead, so Georgia goes into her column. If each candidate wins each of the states they are ahead in, Clinton now wins 357 to 181, a 176 electoral vote margin. 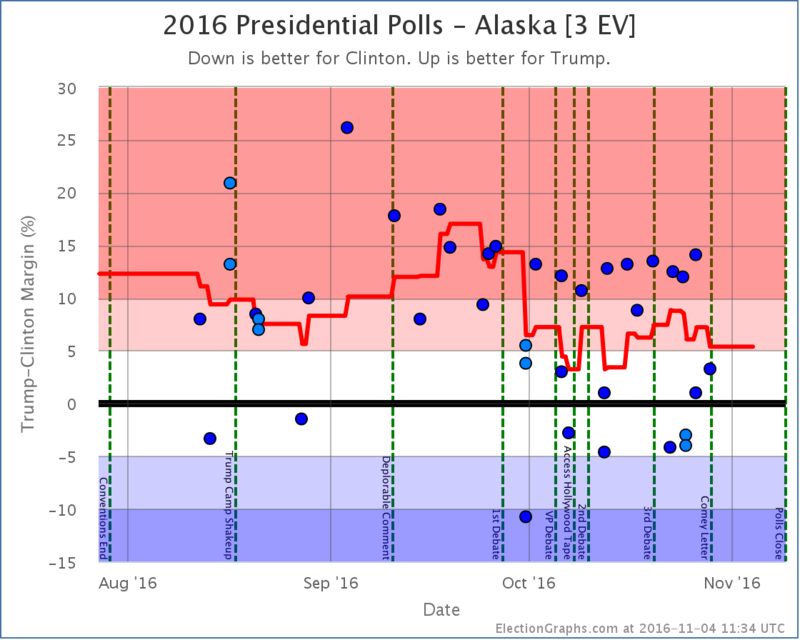 This doesn’t yet match her high in May of a 188 electoral vote win in the expected case, but it is getting close. 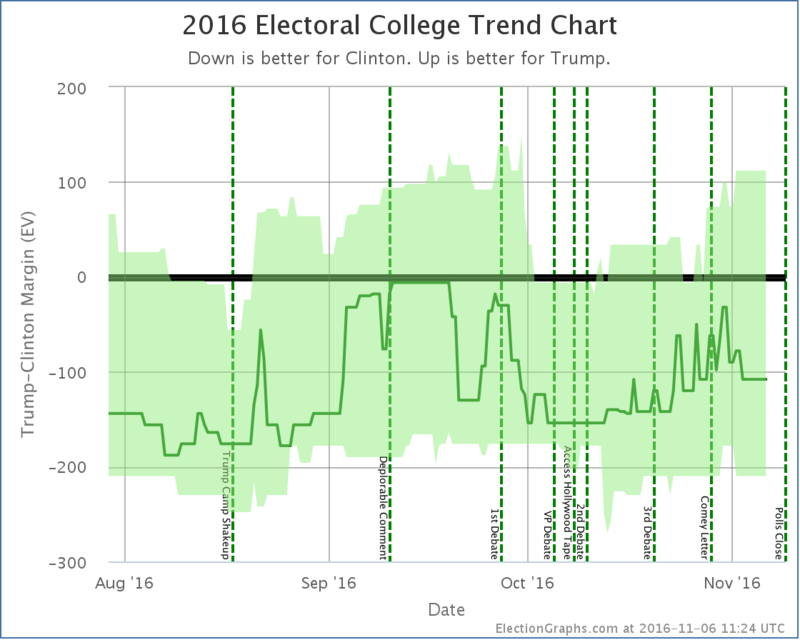 With talk of a massive Trump loss once again dominating the chatter about the election, keep in mind that a 176 electoral vote margin still places Trump in the zone where he is doing worse than Romney (126 EV loss) but better than McCain (192 EV loss). 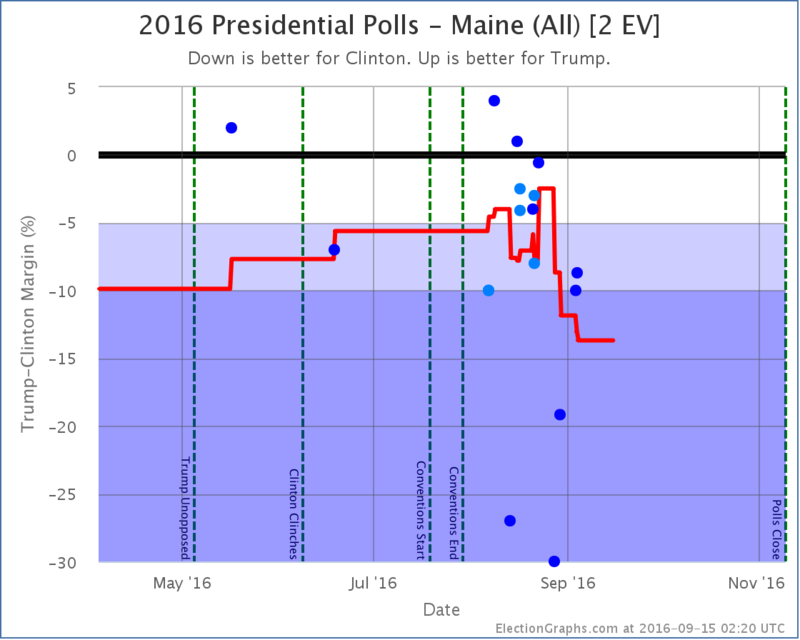 Trump is losing, but it is the same sort of loss as the last couple of Republican candidates, not something of historic proportions. At least not at the moment. Of course, there are 94.2 days until the polls close. That is plenty of time for things to change. A lot. 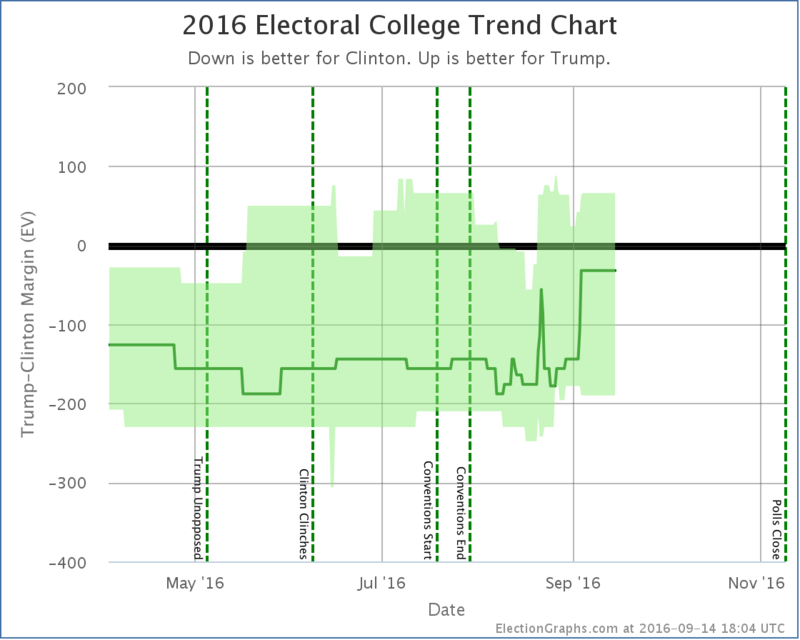 It could get worse for Trump… or it could get better. 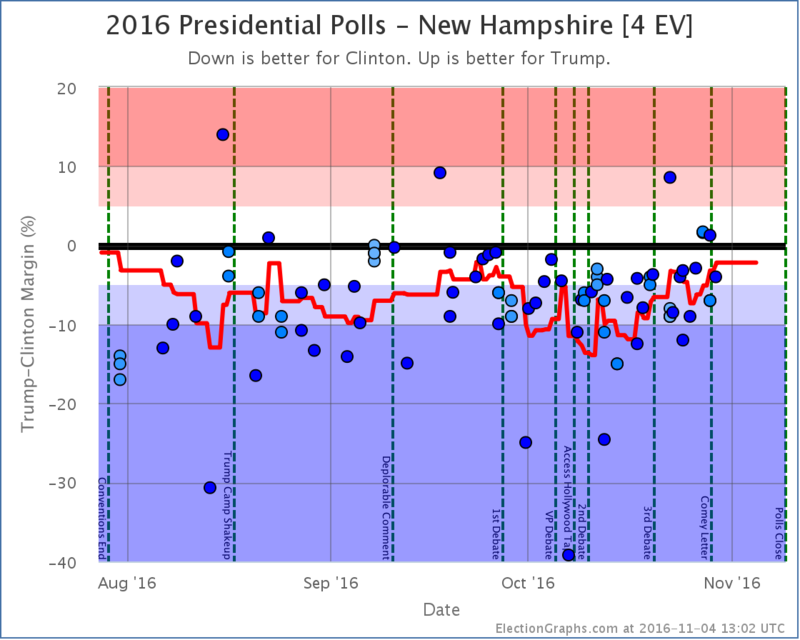 It may well be that the latest drops are part of a Clinton convention bounce and not permanent damage for Trump. We’ll know better in a few weeks. 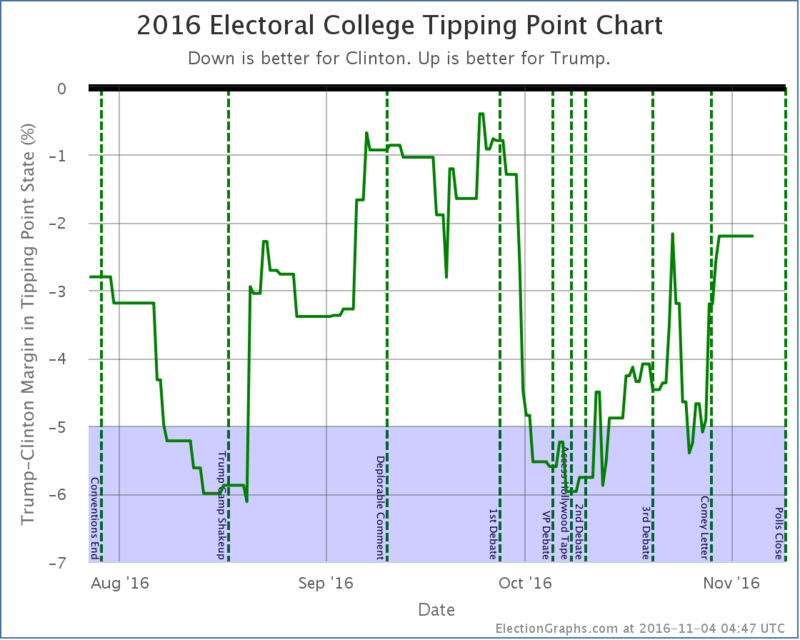 * This was not noted at the time because the poll that pushed Clinton over the edge wasn’t found and added until after the state had popped back to Trump. 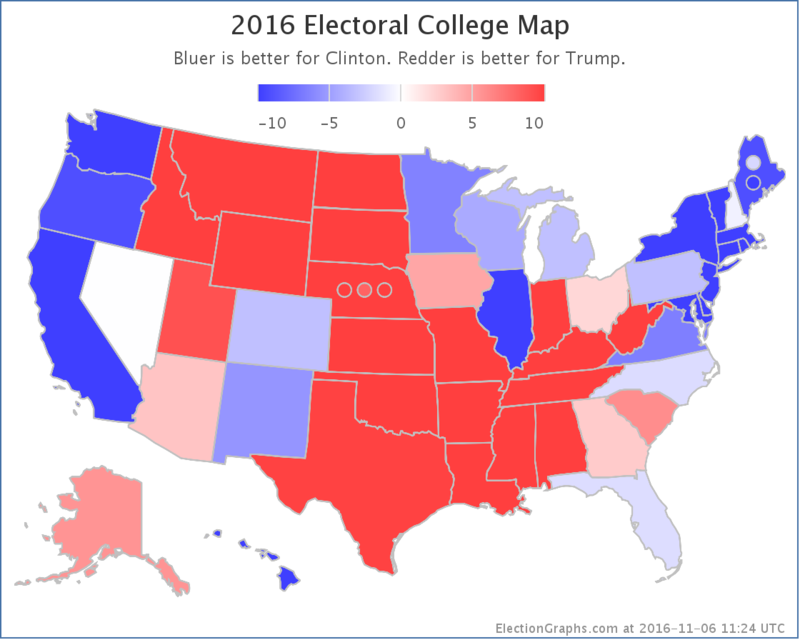 Electoral College: Georgia a swing state? 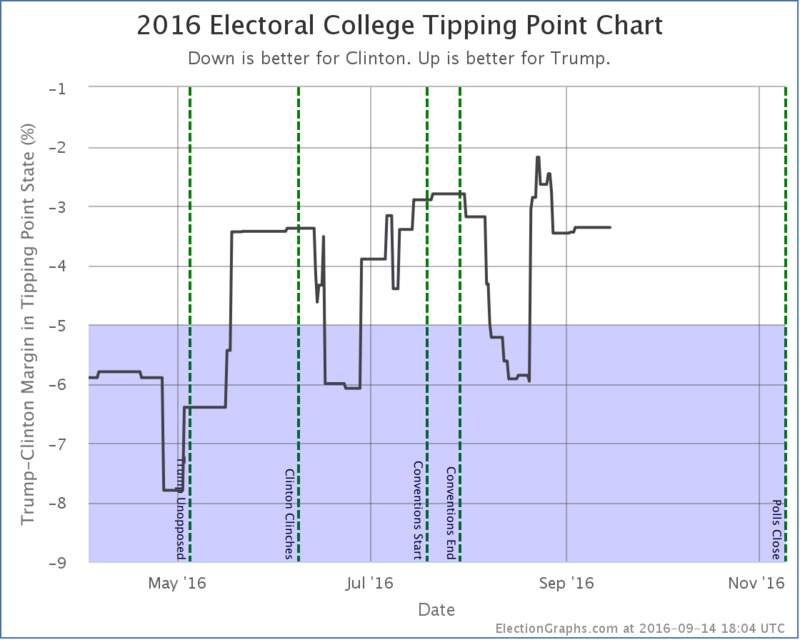 Since the last update on the Electoral College picture there have been polls in Wisconsin, California (x2), Mississippi, Virginia, Pennsylvania (x2), Maryland (x2), New York (x5), Connecticut, Massachusetts, New Jersey, Utah, and Georgia. 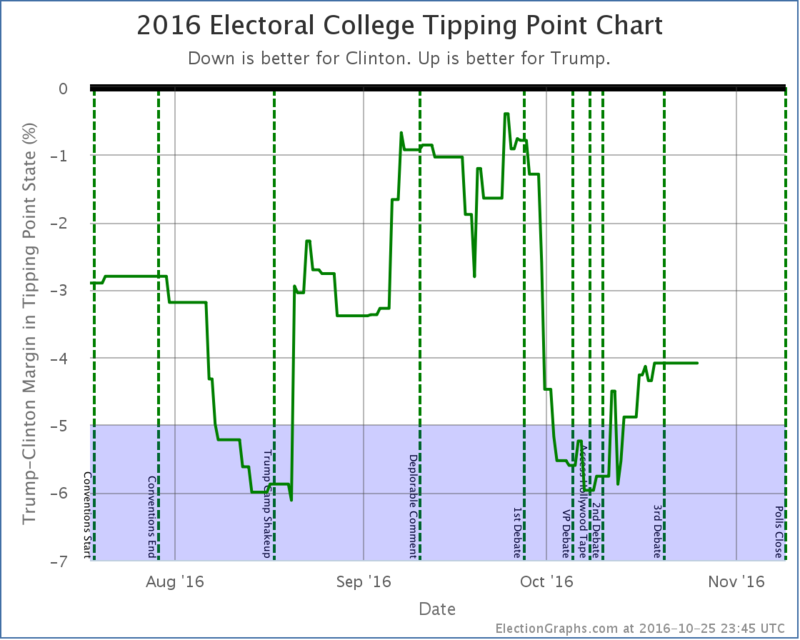 The only one of these that resulted in a change in the overall 2016 electoral college summary was the poll in Georgia. That poll was bad news for both Trump and Cruz. It showed both of them losing to Clinton. 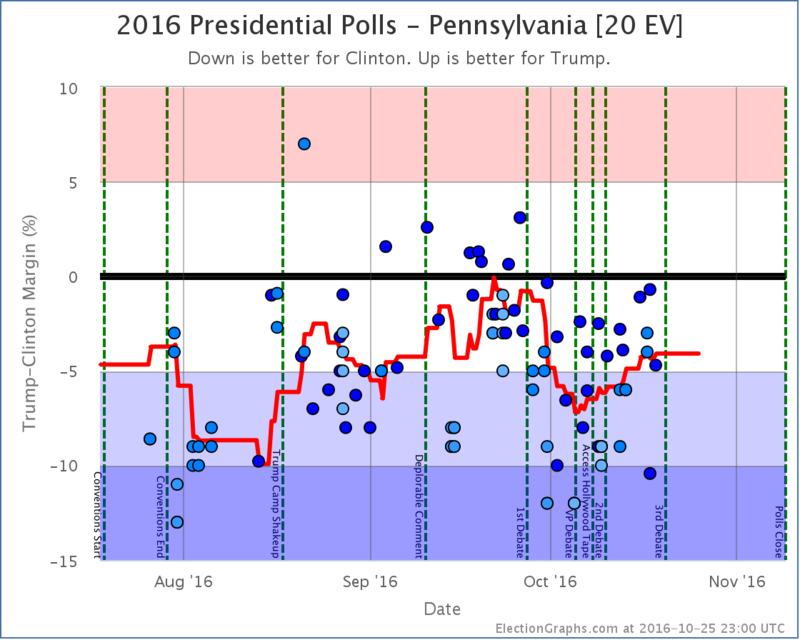 We don’t pay attention to individual polls of course, we look at the averages. 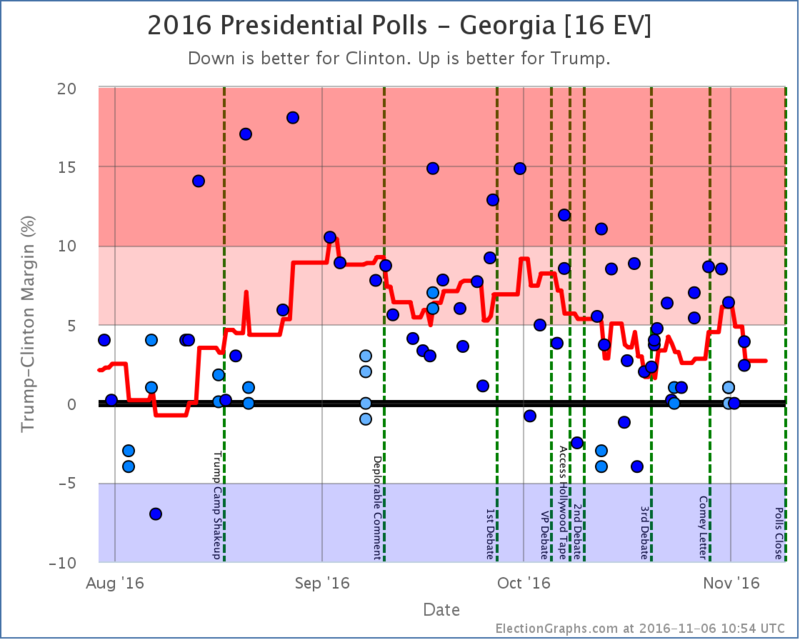 But in both cases adding in this new poll drops the Republican lead in Georgia to less than 5%, which means that Georgia may be in play for Clinton this year. 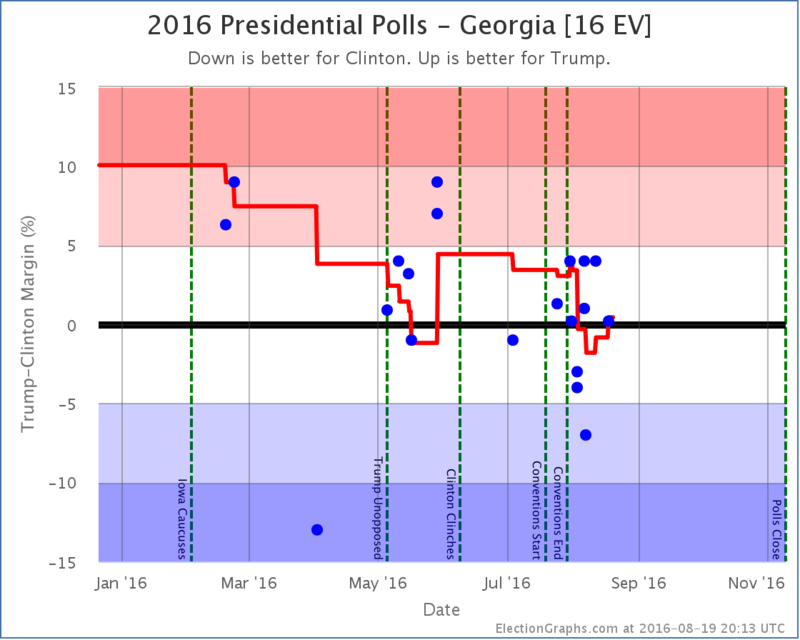 Georgia hasn’t been blue since 24 years ago when it voted for another Clinton in 1992. Georgia has been sparsely polled. 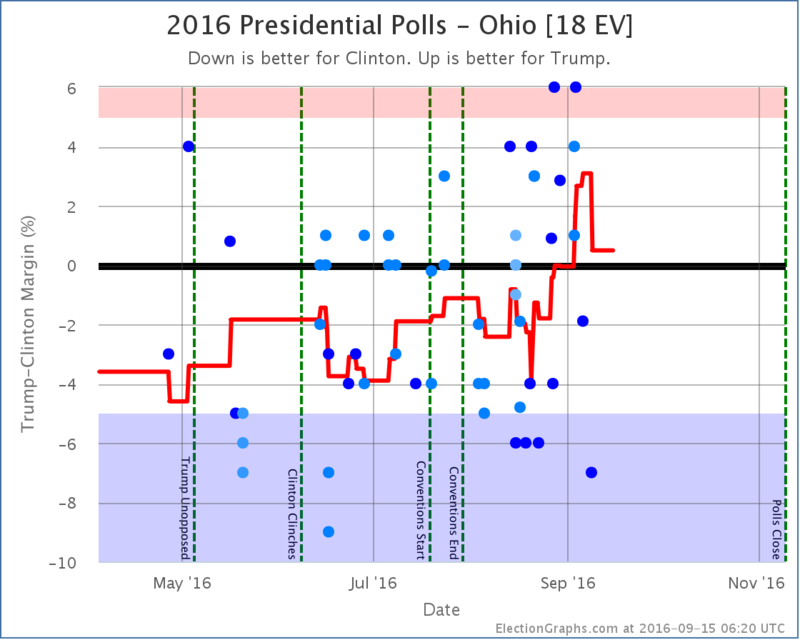 It was not particularly expected to be a swing state. 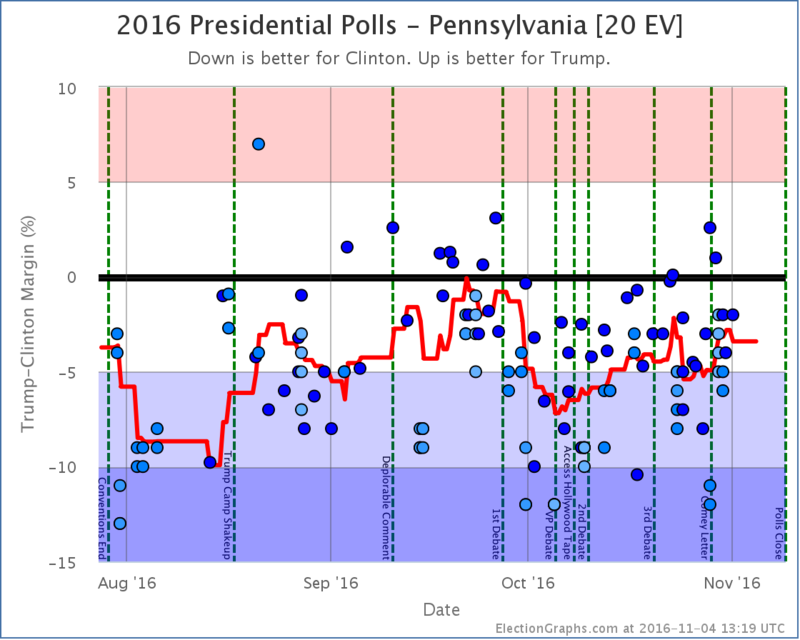 For Clinton vs Trump we only have three polls and so are still using the 2012 and 2008 election results to fill in the poll average. 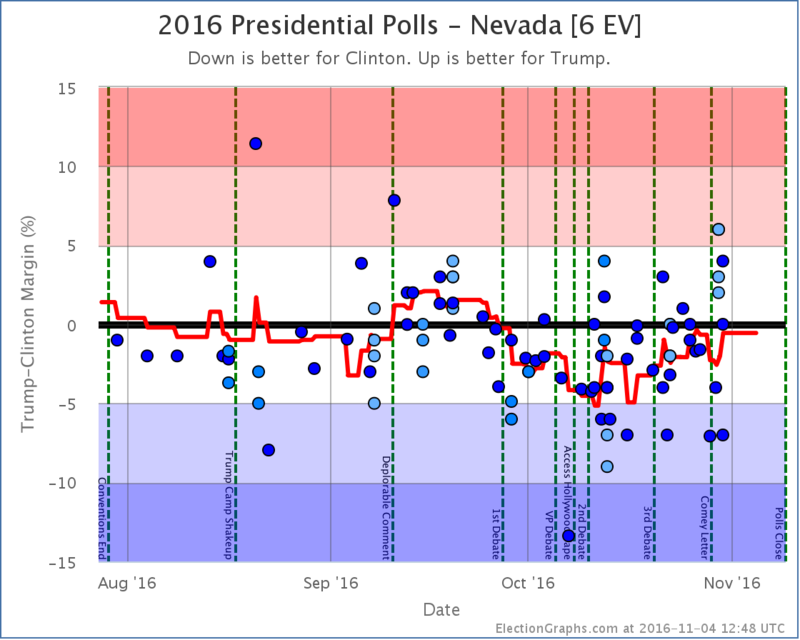 This new poll represents a really large move from the others as well, so there is a potential that future polls will show it to be an outlier. 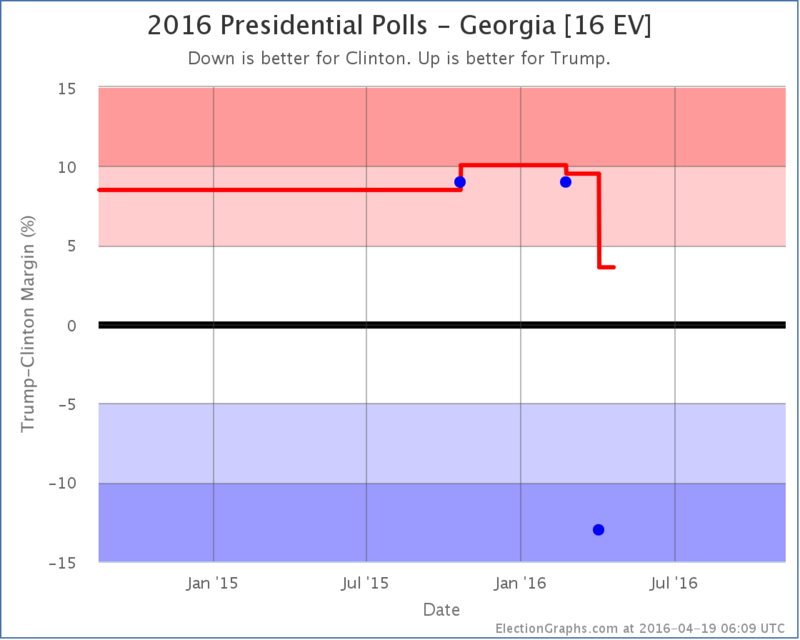 But with those caveats, we now only have a 3.6% lead for Trump, which is close enough that we include picking up Georgia in Clinton’s “best case”. 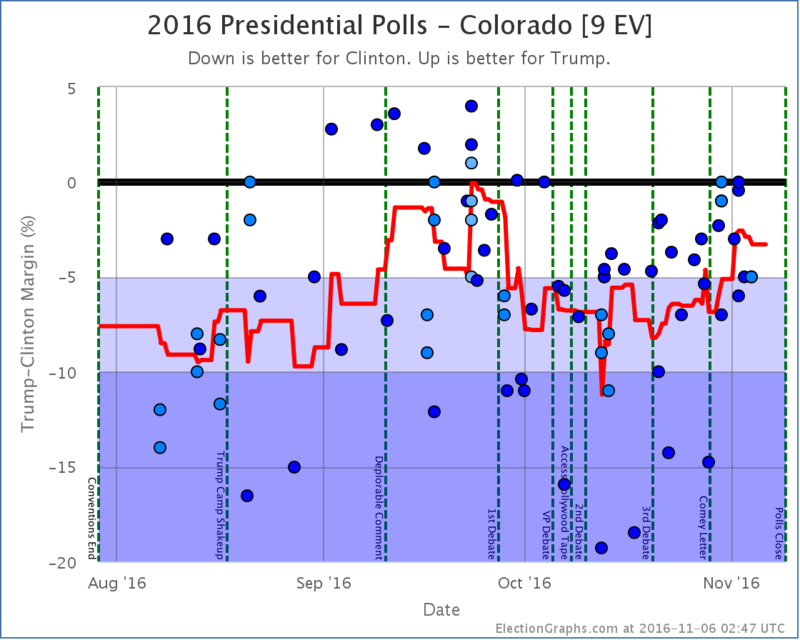 Clinton’s best case, where she wins not only the states she is ahead in, but also picks up the states where she is currently less than 5% behind… that would currently be Colorado (1.9% Trump lead), Georgia (3.6% Trump lead), and Missouri (4.7% Trump lead)… is now a 208 electoral vote win. The last time the margin was that large was when Bill Clinton beat Bob Dole with a 220 electoral vote margin in 1996. Keep in mind however that this is Clinton’s best case. 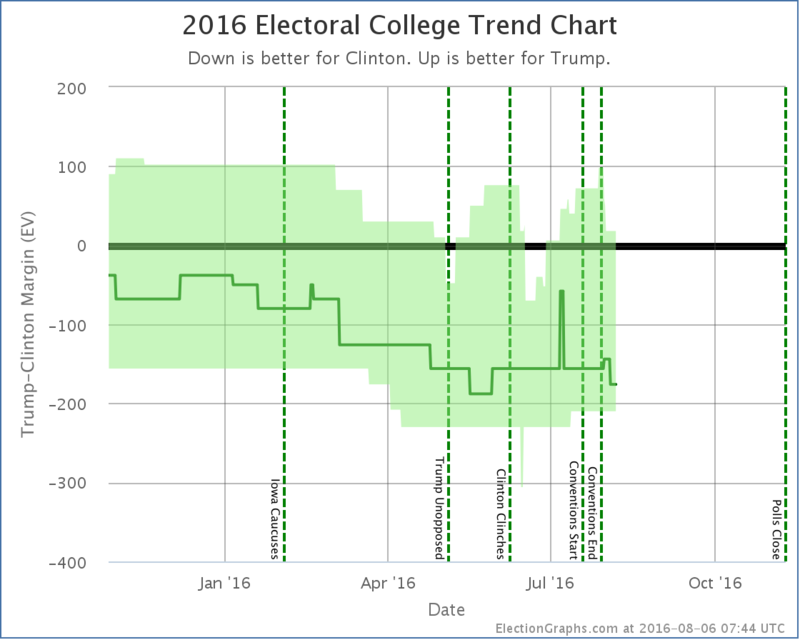 The “expected” result is a narrower 138 electoral vote win. That is in between Obama’s win in 2012 (126 electoral votes) and his win in 2008 (192 electoral votes). 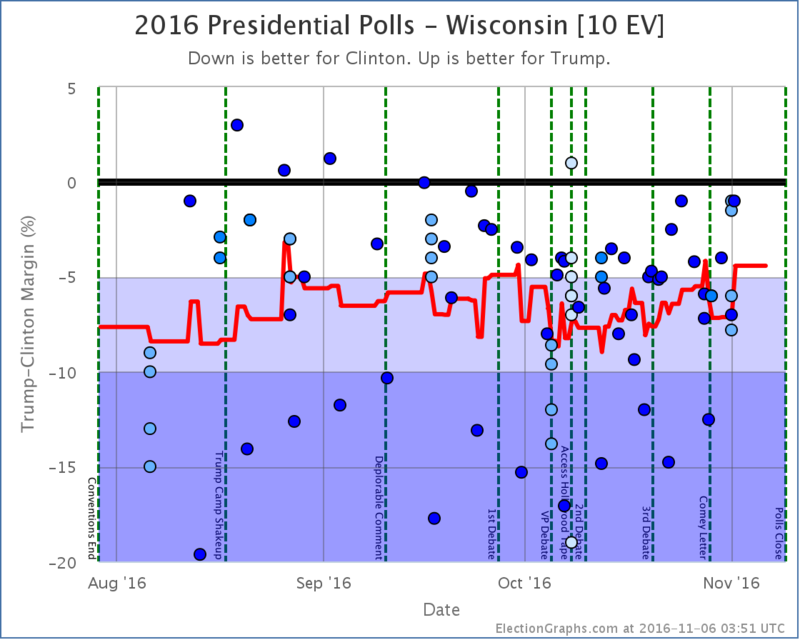 Trump’s best case, where he picks up all six of the weak Clinton states (North Carolina, Iowa, Florida, Ohio, Nevada, and Minnesota) is still to pull out a 30 electoral vote win. 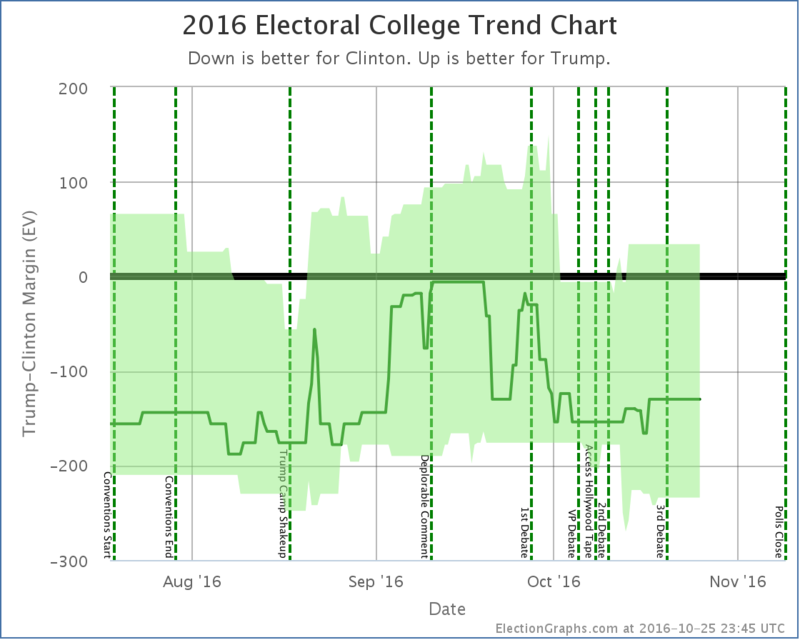 The downward trend in Trump’s general election polling that started in January continues. The questions are “How far does he fall before he bottoms?” and “Can Trump rebound after that?”. Assuming he is the nominee of course. 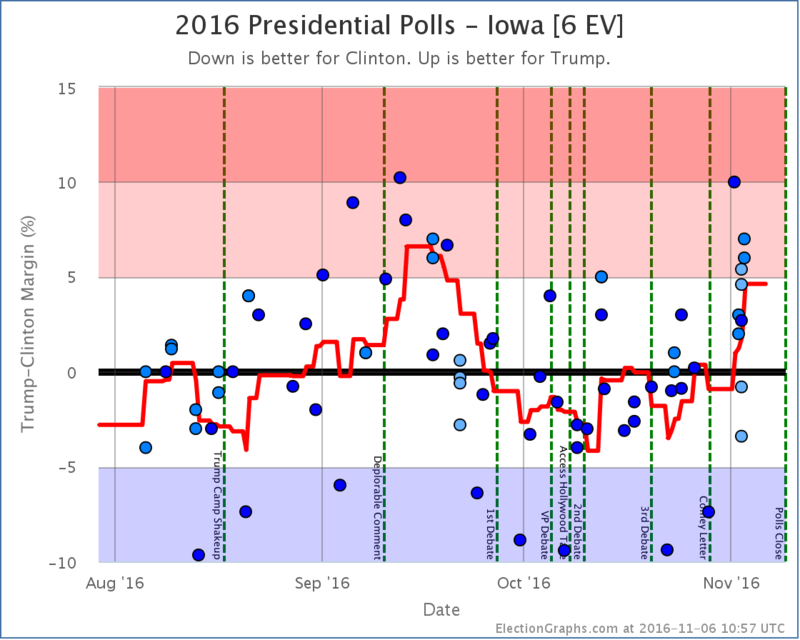 Like Clinton vs Trump, there have only been three polls of Clinton vs Cruz, but in this case one of the three is much older. 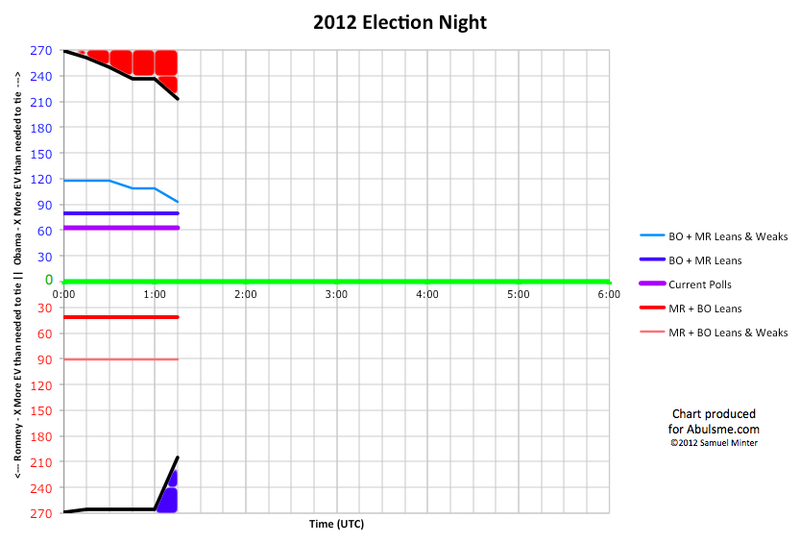 We’re still filling the average with the 2012 and 2008 election results as well. 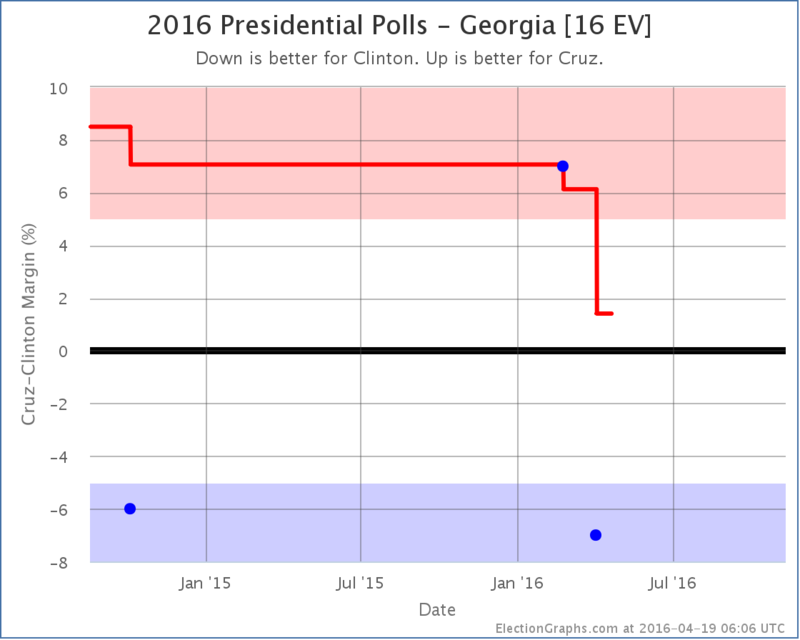 With the new poll, Cruz’s lead in Georgia is down to only 1.4%. 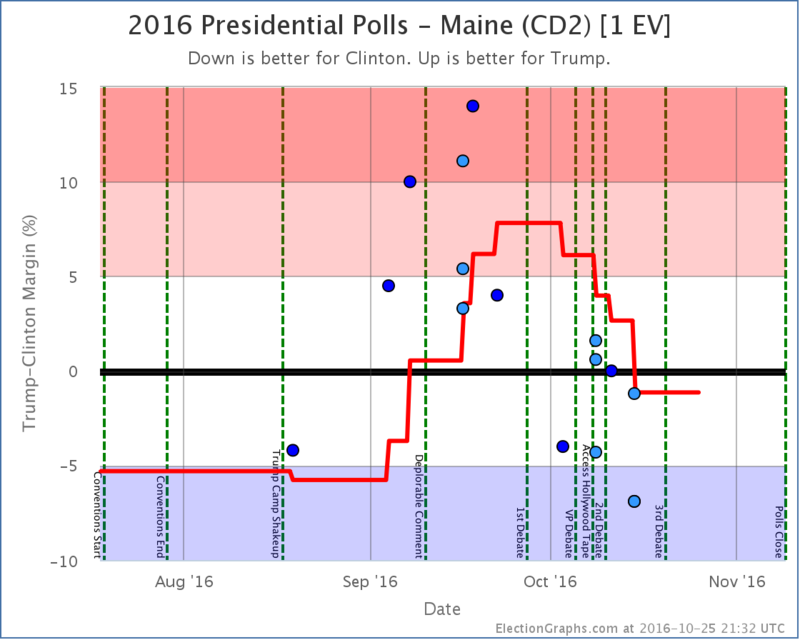 Unlike the Clinton vs Cruz case we actually have two polls showing a similar result, so the case that this is just an outlier is a little weaker. In any case, the average now shows Georgia as a close state. 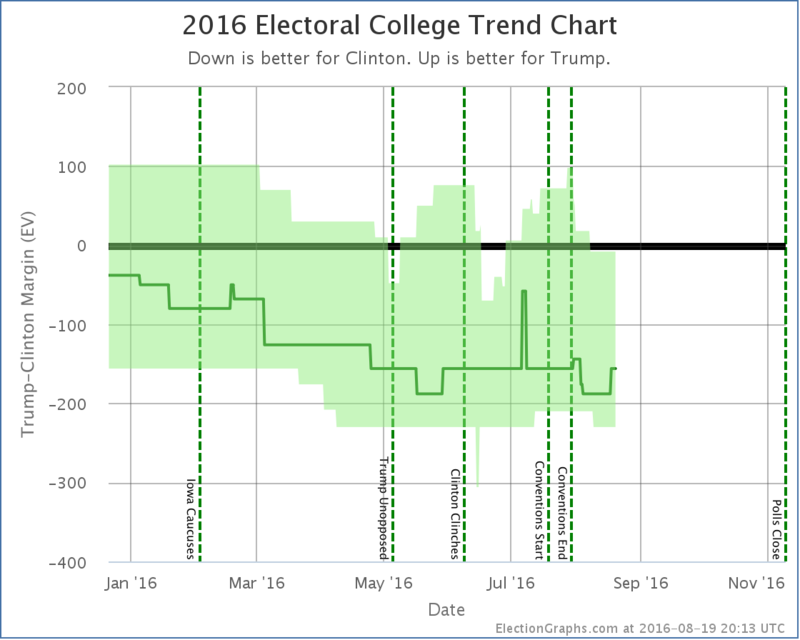 Clinton’s best case here improves to winning by 188 electoral votes. 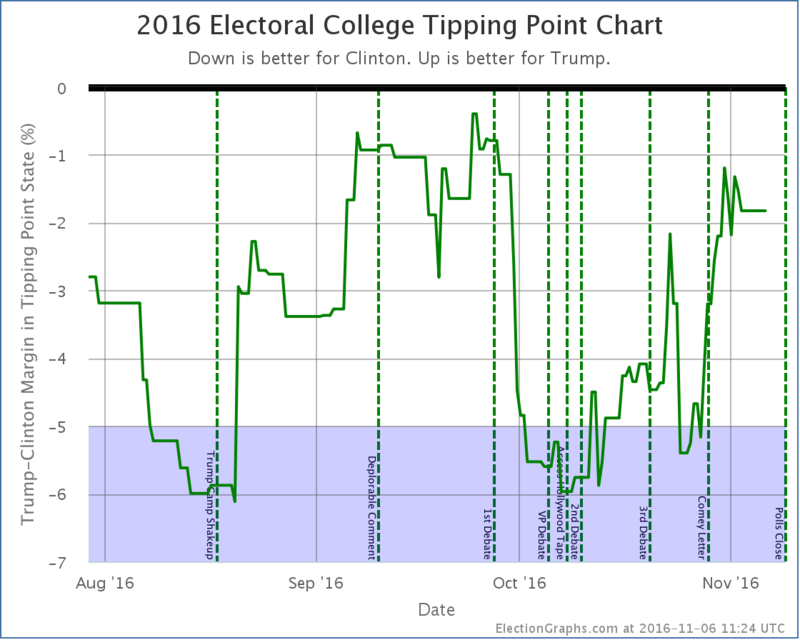 Comparing Cruz and Trump, Cruz is doing better in the tipping point metric, in his worst case, and his expected case. 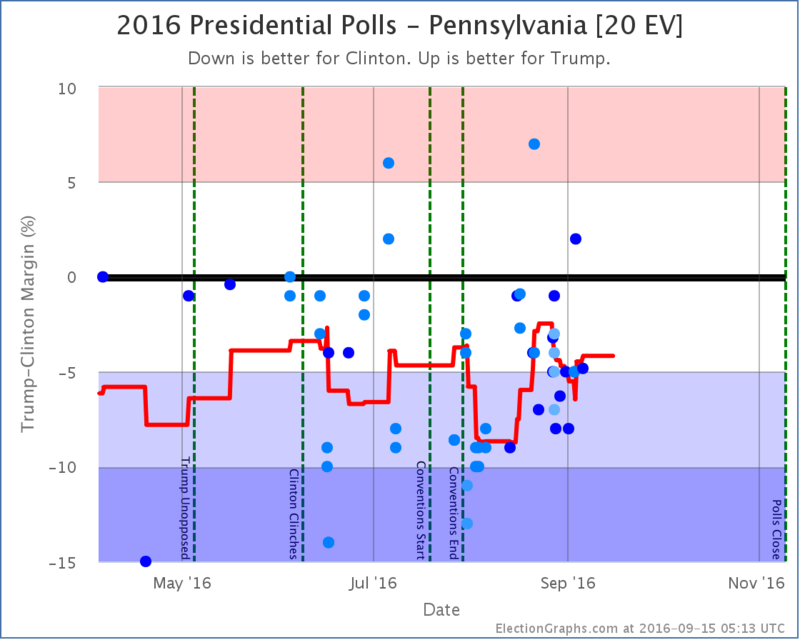 He and Trump tie in their best case, with the narrow 30 electoral vote win. 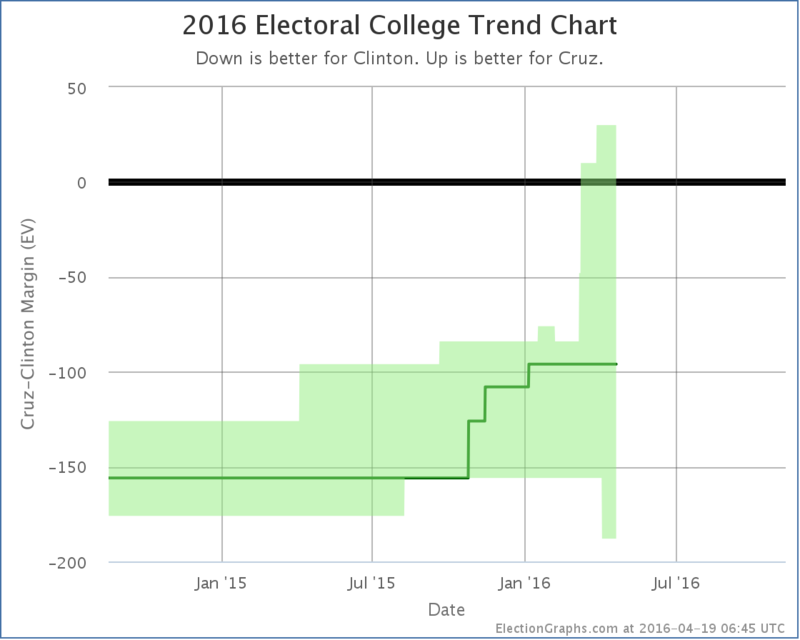 Cruz’s trend has also generally been an improving trend. 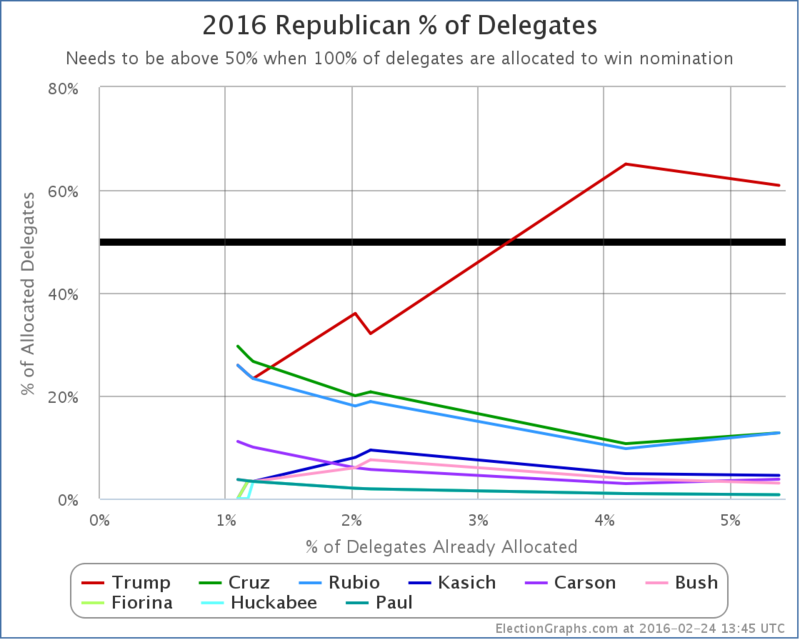 Today’s change is actually notable for being only the third decline for Cruz in my summary in the last year. 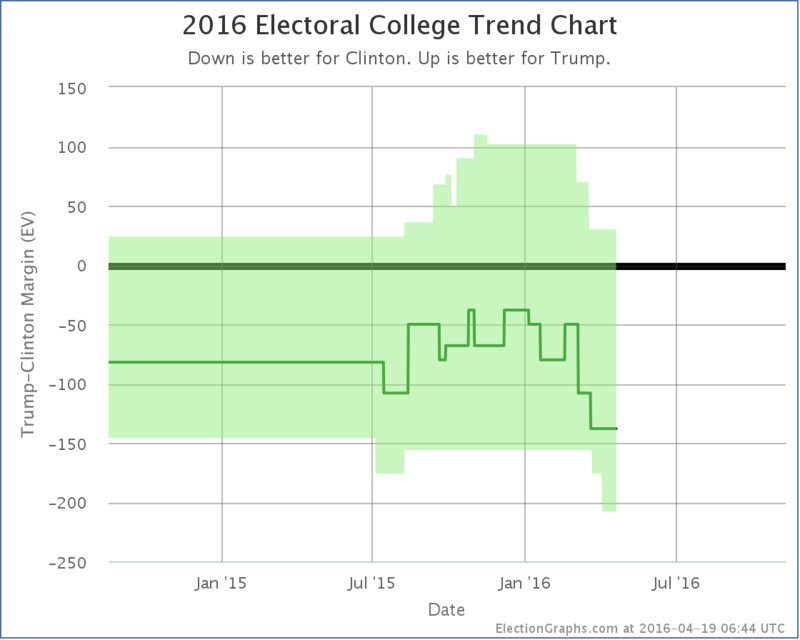 This decline then brings up the opposite question than the one we asked about Trump. 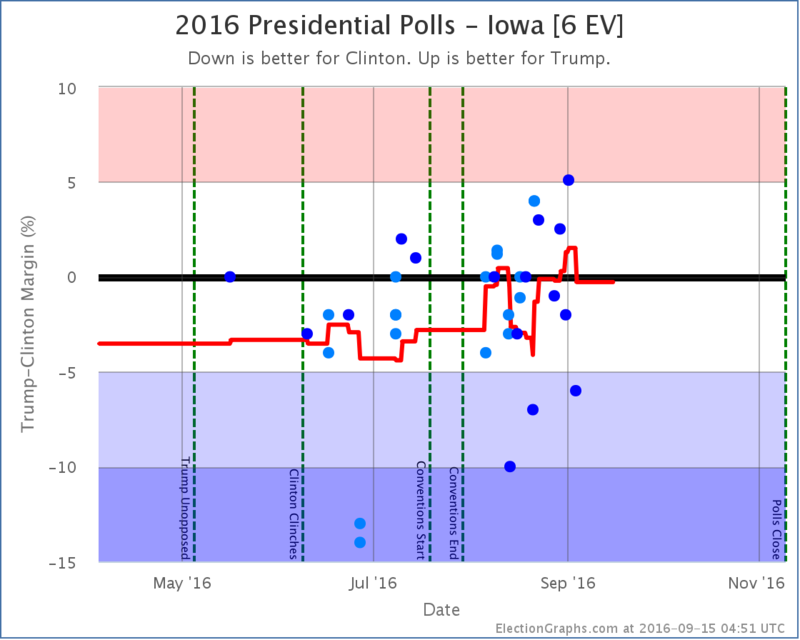 Rather than asking when we will reach a bottom, with Cruz the question is when he will peak. 203.4 days until the general election polls start to close. There were no states called between 00:45 UTC and 01:00 UTC so there was no 01:00 update. But there were tons of states called between 01:00 and 01:15 though. 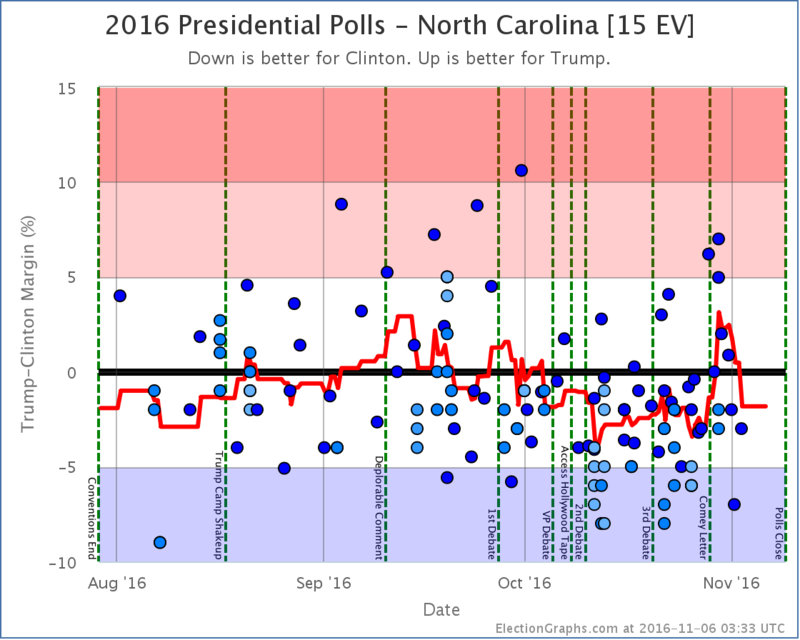 I also corrected the light blue line in the chart, which I’d neglected to decrement when Romney won South Carolina. 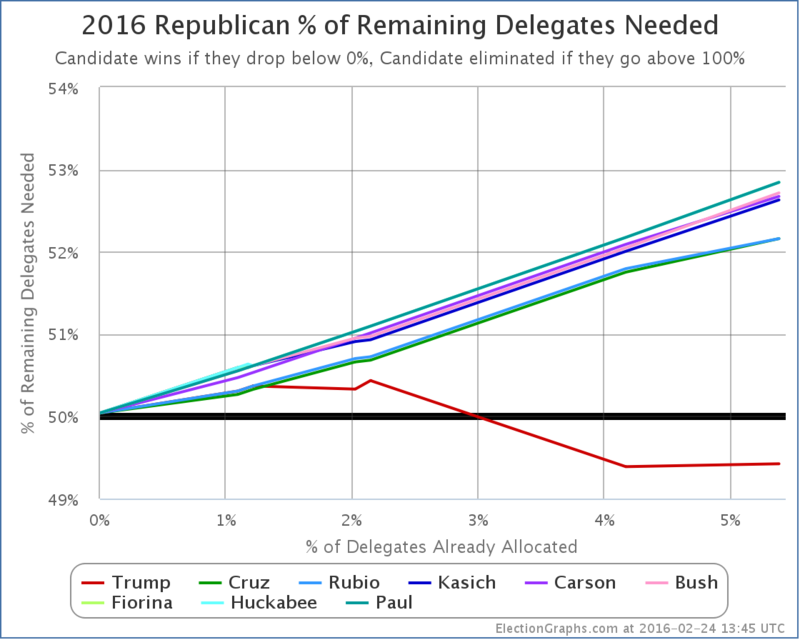 That line represents the states where Romney was ahead by more than 5%, but less than 10%. The three scenarios remain the same though, as no close states have been called. In 2008, since McCain’s best case was still to lose, I also tracked a “McCain SuperBest” case on election night, the case where he would have won all the states he was behind by less than 10% in. That was to keep it interesting in a race that wasn’t close. No need for that this time. This time we wait for the states that are actually close. 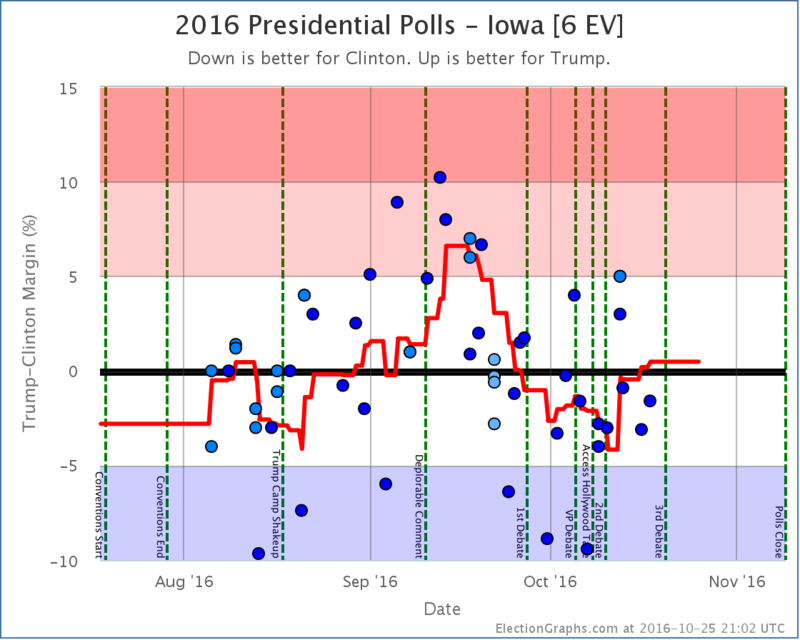 As election day approaches, the number of polls coming in each day has increased dramatically, and that means some states will be jiggling just from the higher volume of polling, although some of it may represent actual movement too. 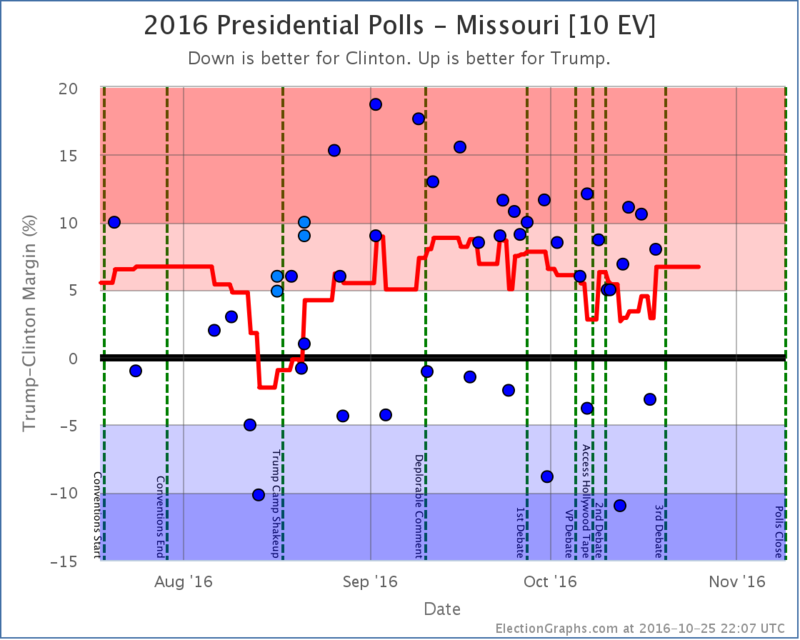 Missouri had been trending further toward Romney, but the last poll looks like Obama may be gaining a bit of support there. 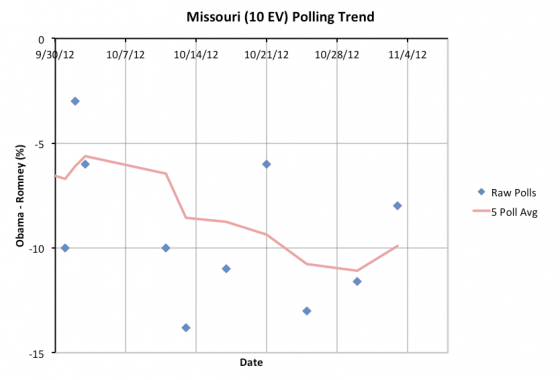 It doesn’t matter though, Romney is going to win Missouri. 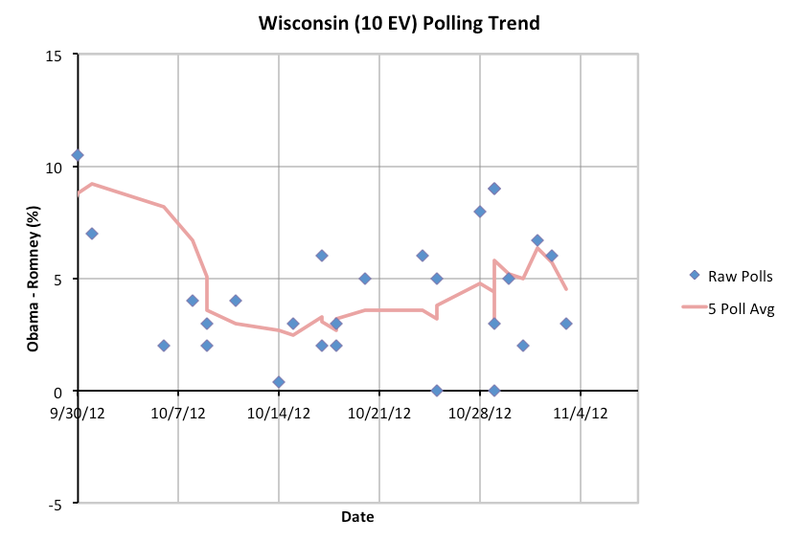 Wisconsin had bounced up to over a 5% Obama lead. 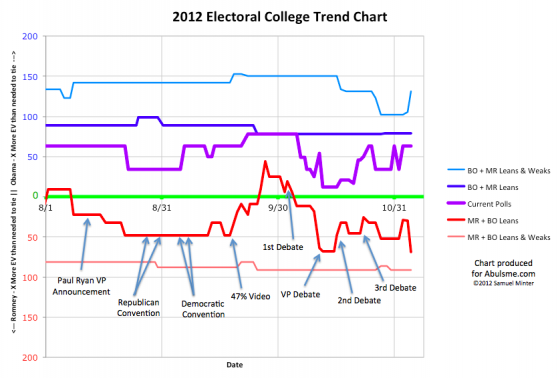 It now falls below that level to a 4.5% Obama lead. 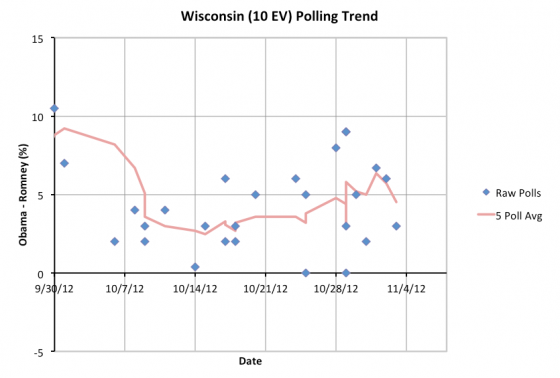 This is close enough that I once again classify Wisconsin as “Lean Obama” and therefore a state that Romney could win. But of all the close states, this is the one with the second largest Obama lead. There are many closer states that are better Romney targets as he tries to claw his way to 270. 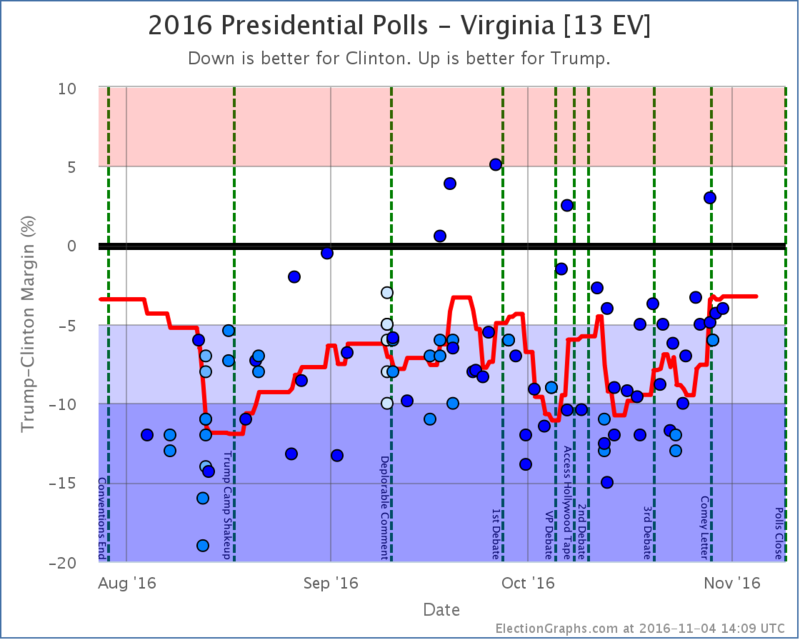 Ever since Thursday I have been mentioning the big ugly outlier in Virginia. Well, today it finally rolls off the five poll average. With this the average drops to a 3.6% Obama lead. Virginia would never have left the “close state” category without the outlier, but even without the outlier, Obama has been making gains in Virginia. 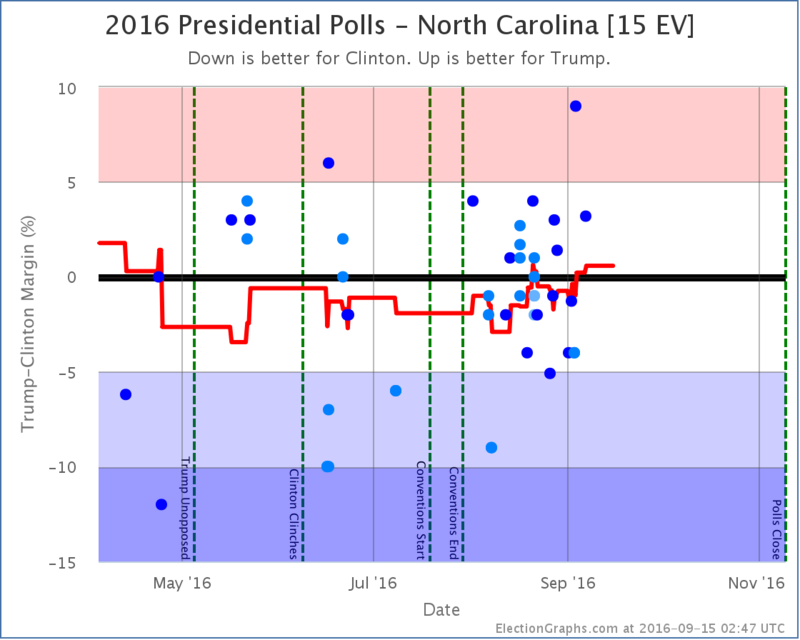 A week ago all the polling indicated a tied race in Virginia. No longer. It is still close, but now Obama has a clear lead. Of the states changing status today, Virginia is currently the closest, and it is also the only one with a history of actually being very close. At the moment, Virginia isn’t close enough compared to the other close states to actually be part of Romney’s “easiest path to victory” which I’ll cover later in the post, but given the history of polling in the state, it could easily get closer again before we are done, so it still has a chance of making a difference in the race if Romney can win it. This state is “getting closer” only because the outlier is rolling off the average though. 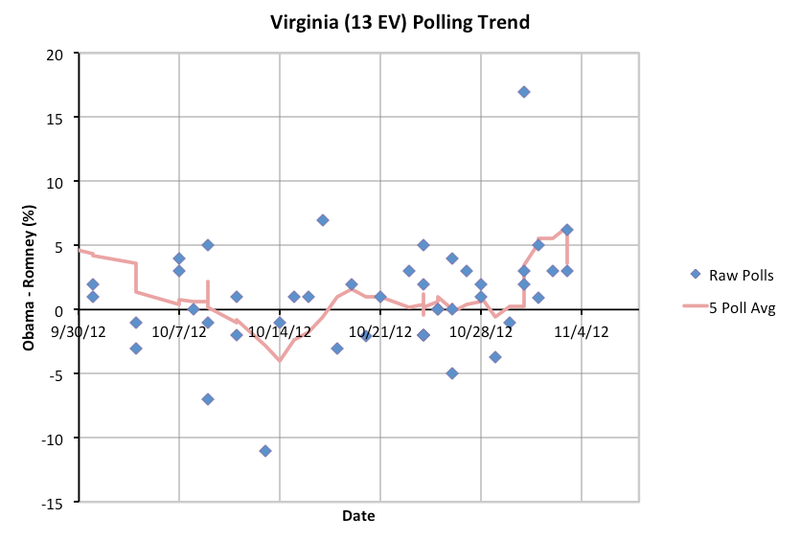 Without the outlier, the trend is actually toward Obama in Virginia. 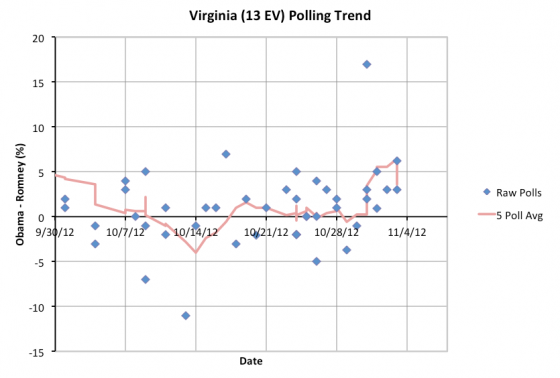 Virginia seems to be slipping away from Romney. 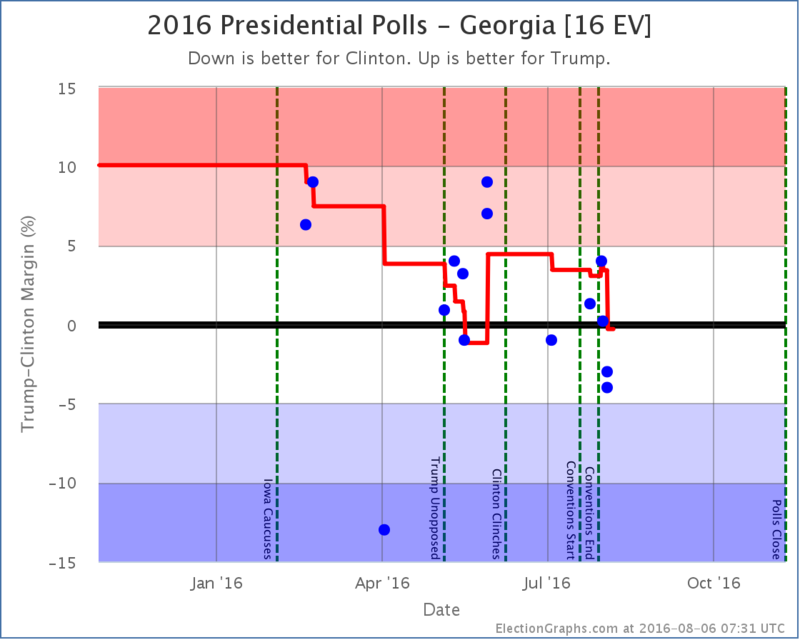 I am showing a chart since August to show a bit more context for Georgia. 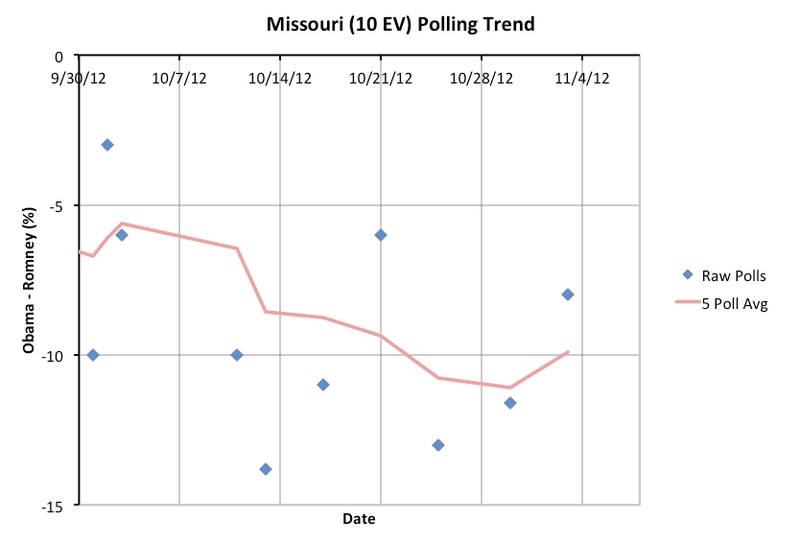 The five poll average moved to a greater than 10% lead for Romney due to what is a clear outlier in September. 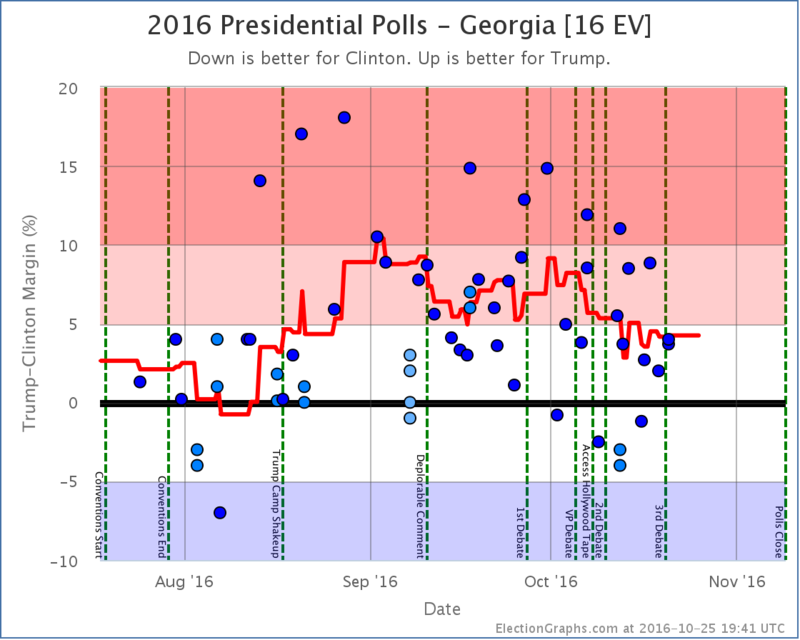 Polling has been sparse in Georgia, because it hasn’t been in contention this cycle, so that outlier only rolled off the average today. I now have Romney with a 7.5% lead in Georgia. So this “gain” for Obama doesn’t matter. 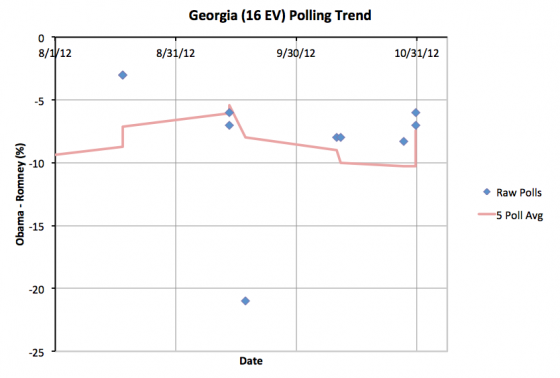 Romney will be winning in Georgia. 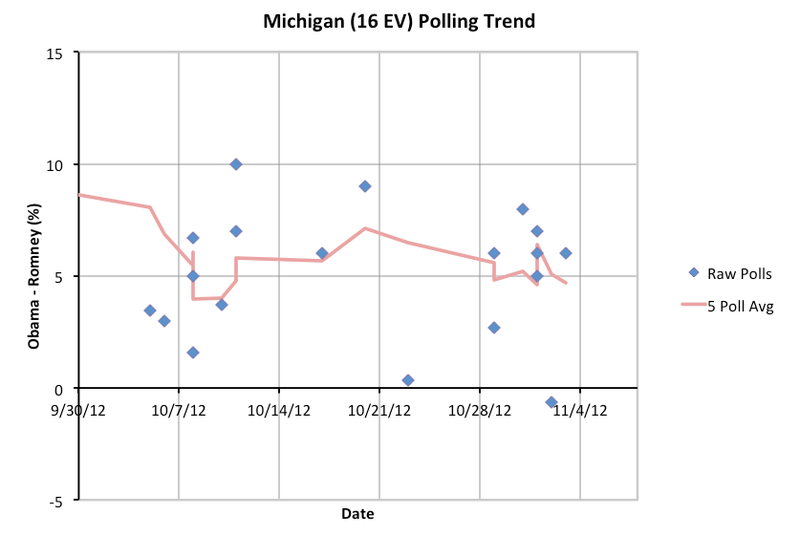 Anyway, at 4.7%, Michigan has the biggest Obama lead of any of the current crop of “close states”. Like Wisconsin, this means that there are a lot of other states that would be easier for Romney to take the lead in that Michigan. If Romney actually pulls ahead in Michigan, this means it is very likely that he has already pulled ahead in all of the other close states… at which point he would not only have won, but be heading for a pretty comfortable victory. 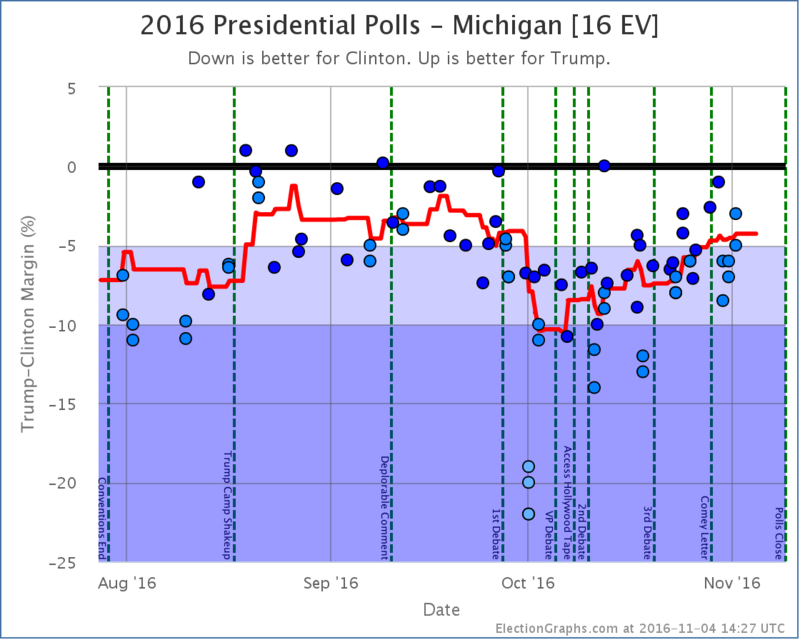 So while it might be a bit closer than it was (maybe), Michigan is still quite unlikely to end up flipping to Romney, or to be one of the critical states in the last days. 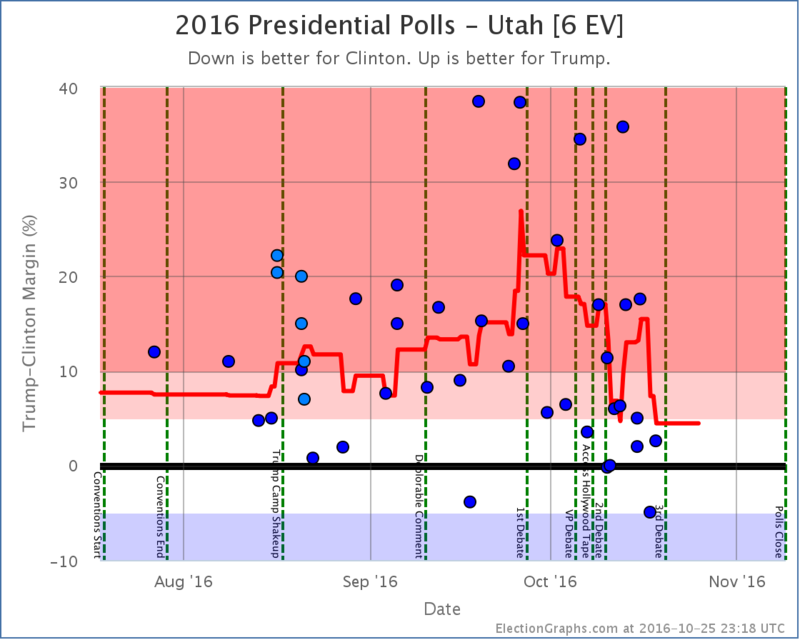 Romney’s best case now actually is the best it has been ALL YEAR LONG, exceeding his best case at the peak after the 1st presidential debate. In a sense, this does represent a Romney comeback in the last few days. He *is* making a bunch of states closer. 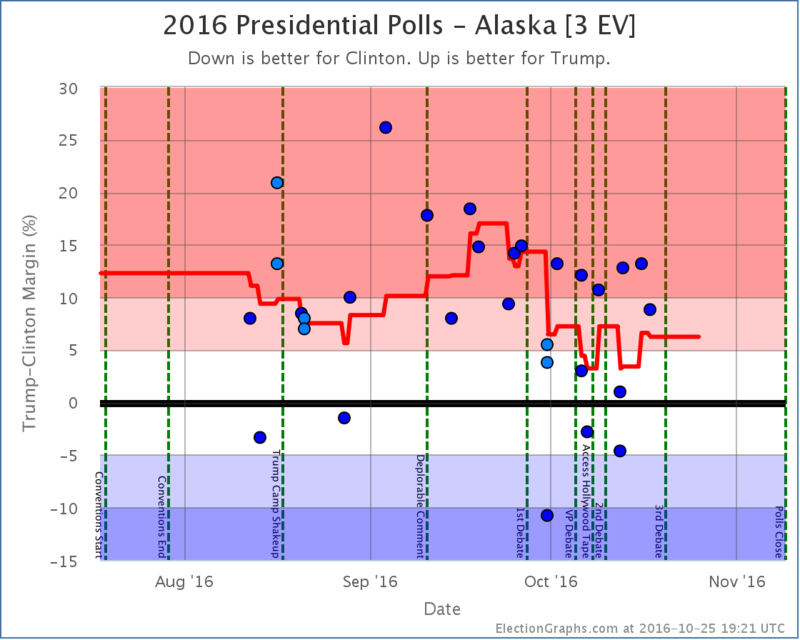 He has taken a bunch of states where Obama had been ahead by more than 5%, and pulled them back so they are somewhat close. This may help him in the popular vote, but in the electoral college, it doesn’t look like he has moved any of these states ENOUGH. He may be making states closer, but he is NOT pulling them over the line to him. Meanwhile, while Obama hasn’t been pulling ahead by more than 5% in more states, and he hasn’t managed to pull any more states to his side either, he actually has been increasing his lead in some of the most critical states. That is a lot of close states! But what can be seen here? Out of 13 close areas, only FOUR moved toward Romney in the last week. Colorado, Pennsylvania, Maine’s 2nd congressional district, and Michigan. 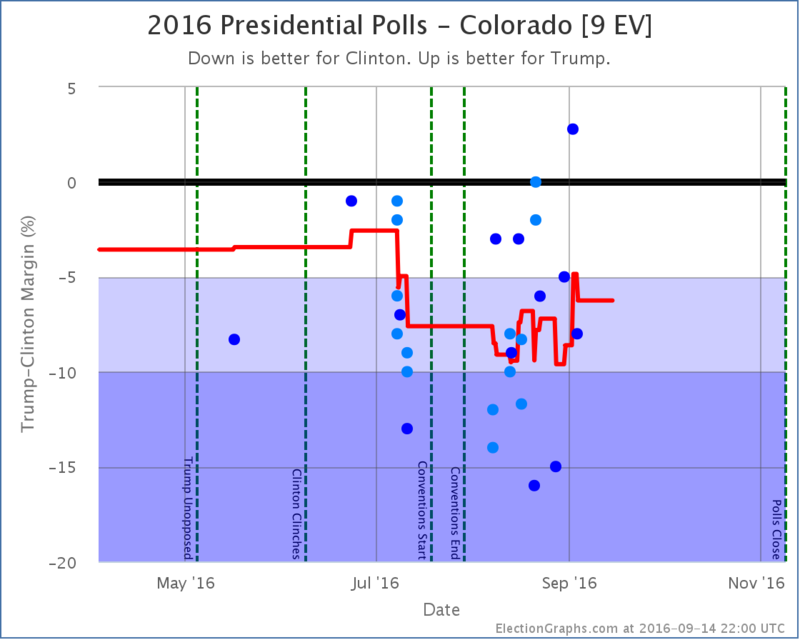 Of these only Colorado is in Romney’s easiest path to victory. 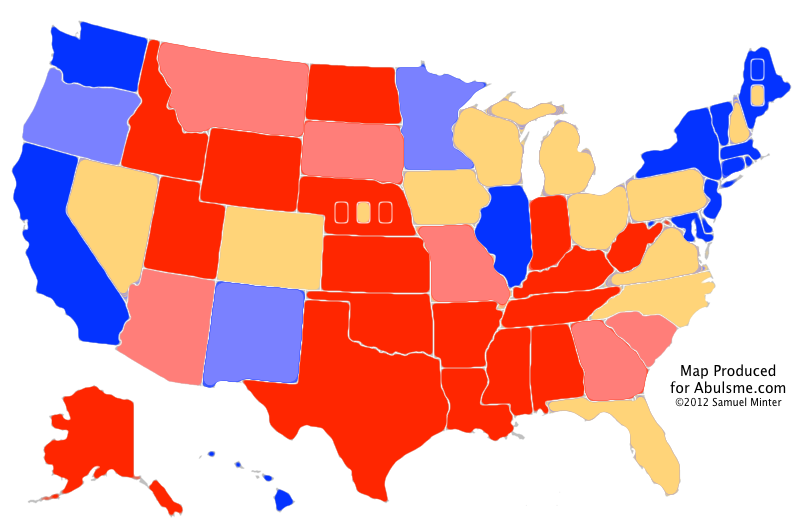 I listed the states above in order by the level of Romney support from highest to lowest. 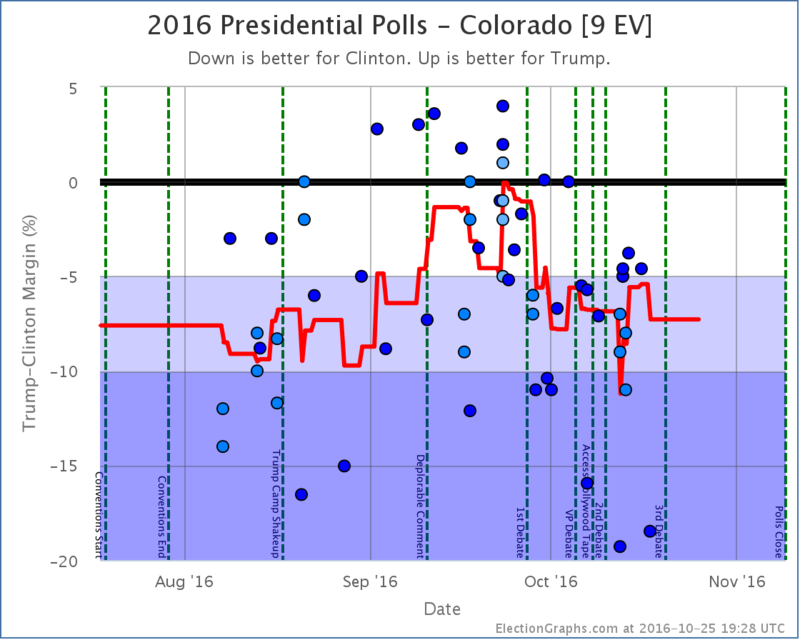 That means the states he NEEDS to be improving in the most in order to win are Colorado, Florida, New Hampshire, Ohio and Iowa. 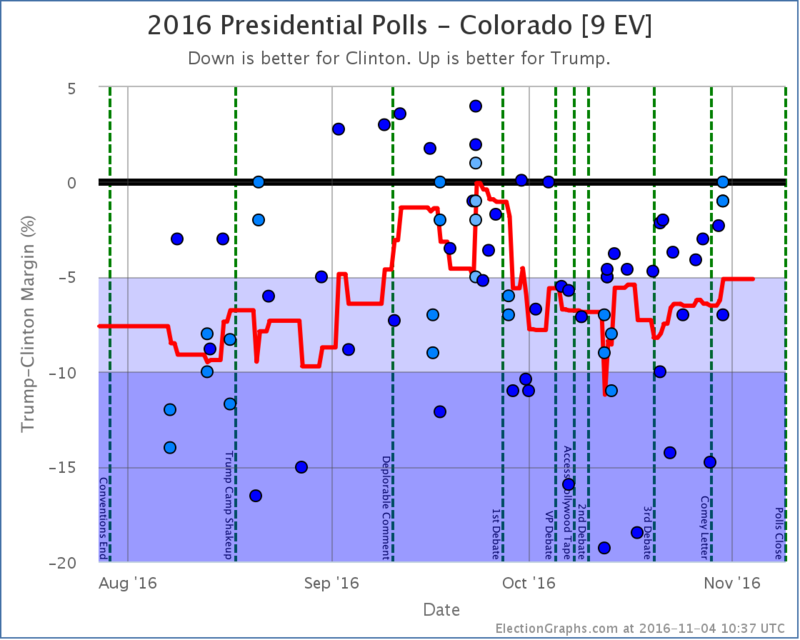 Looks like Colorado is almost tied now, so I guess whatever Romney is doing there is working and is time well spent. 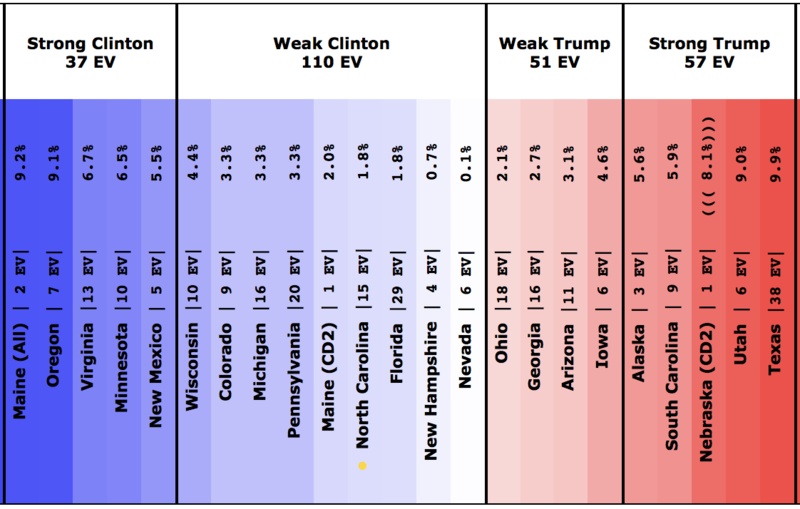 But the rest of these critical states are moving the wrong direction for Romney. There has been speculation that Romney is trying to do a “hail mary” of some sort, trying to actually win Pennsylvania and Michigan as an alternate path to victory. The states he is ahead in, plus Florida, Colorado, Pennsylvania and then Michigan is certainly another path to victory. But given Obama’s current leads in those states, going through New Hampshire, Ohio and Iowa certainly seems like an easier path than Pennsylvania and Michigan. 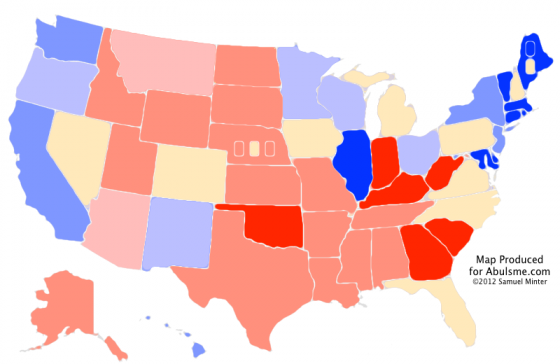 Perhaps Romney’s internal polling shows Obama’s support is “softer” in these states though. 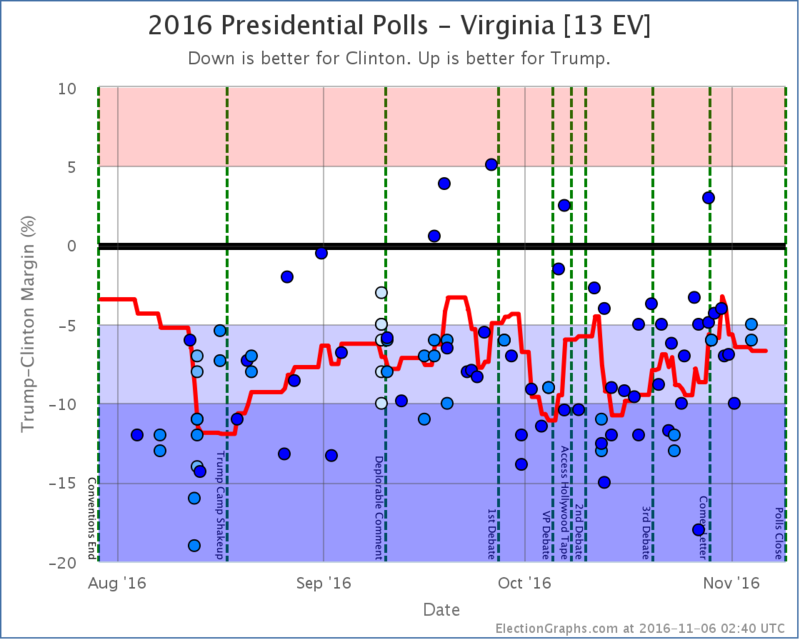 The Virginia outlier is gone, so now the chart can be interpreted directly. (I’ve removed the little x’s showing what things would have looked like if I had manually removed the outlier.) 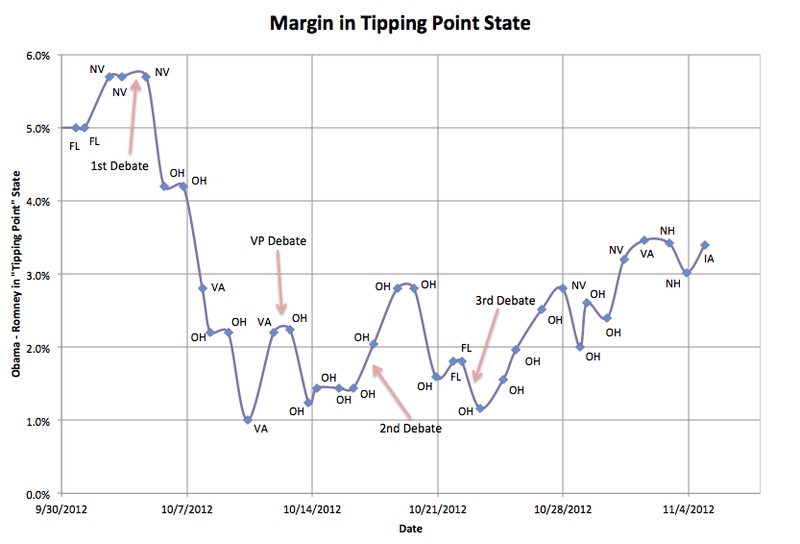 Iowa is now the tipping point state, and Obama is ahead by 3.4% in Iowa. 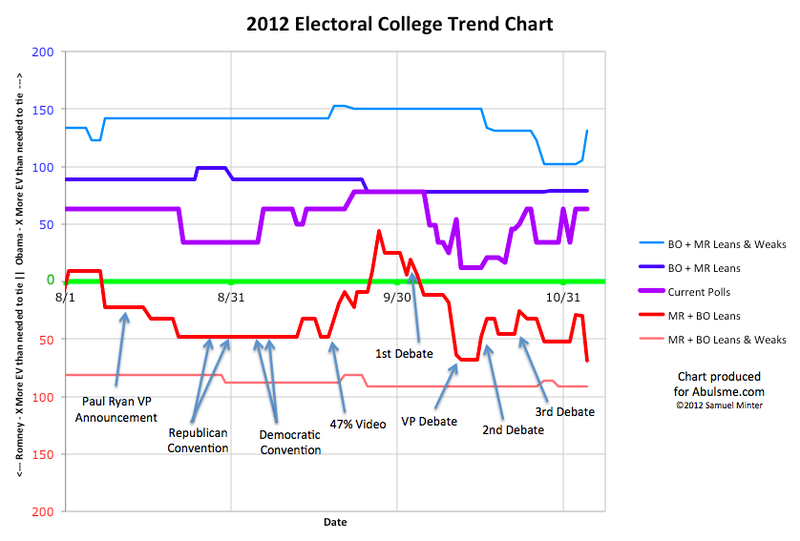 There was a dip in the past few days (which was slightly more without the Virginia outlier) but Obama’s popped up again. If Romney manages to move the polls in all the close states by at least 3.4%, he can win. But that is a tall order at this point. A very tall order. As I type there are 48 hours and a few minutes left until the first polls start closing on election night. 3.4% is a huge move in such a short time. Something incredibly dramatic would have to happen to move opinion that much in the final moments. 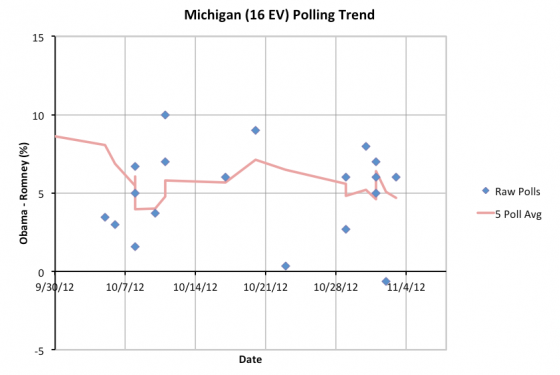 Romney’s only real hope at this point is that all the polls are wrong. Absent that, Obama wins a second term.